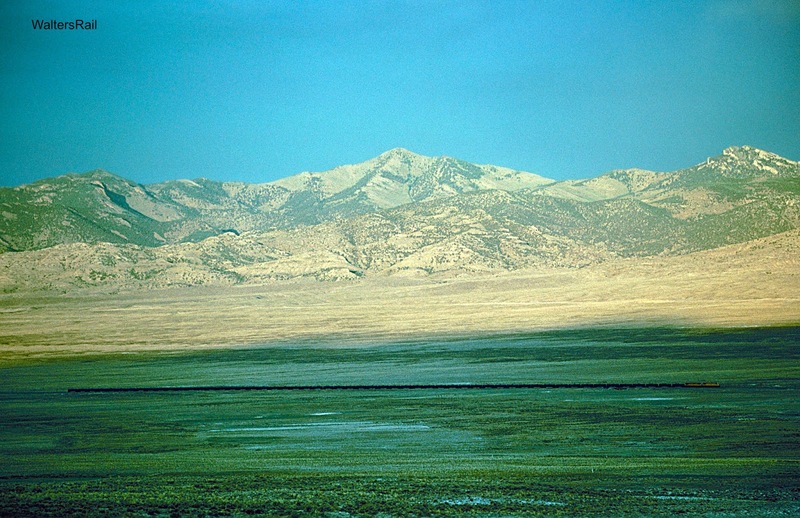 Over the years, I have photographed the UP across the western United States. I present herein images from some of my favorite locations -- some well known, some perhaps more obscure. I make no attempt to provide inclusive coverage. Rather, the following is a collage, an impression, of America's most recognizable railroad. In some of these locations, the Union Pacific took over operations from its predecessors Southern Pacific and Western Pacific. To the extent I have images of those roads, I also offer them here. 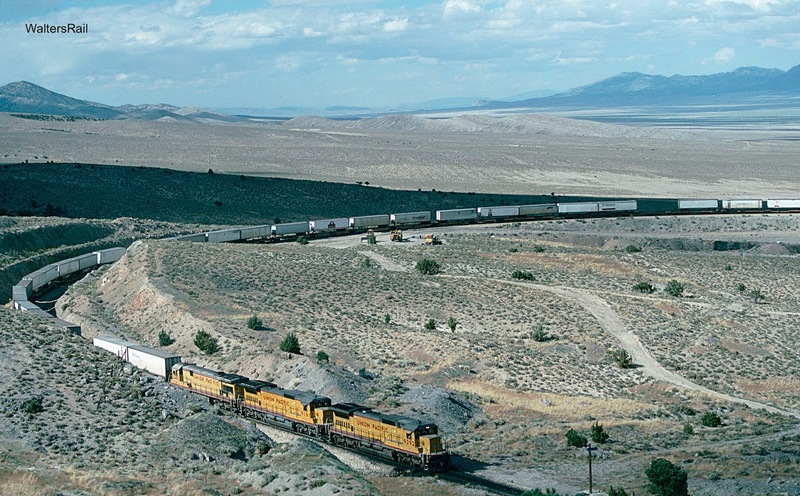 An eastbound mixed freight rolls downgrade at Arnold Loop, Nevada. The Western Pacific Railroad commenced freight service between Salt Lake City and Oakland on December 1, 1909. 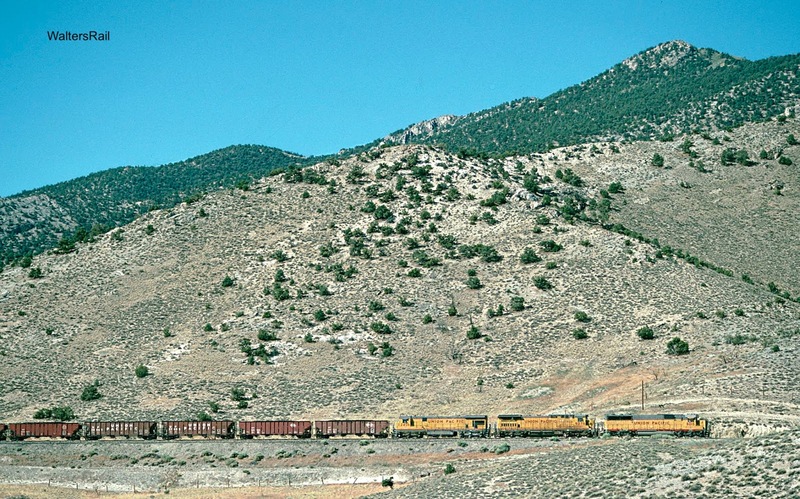 The initial route crossed Silver Zone Pass in far eastern Nevada on a three-percent westbound grade that brought even the smallest passenger trains almost to a stand-still. 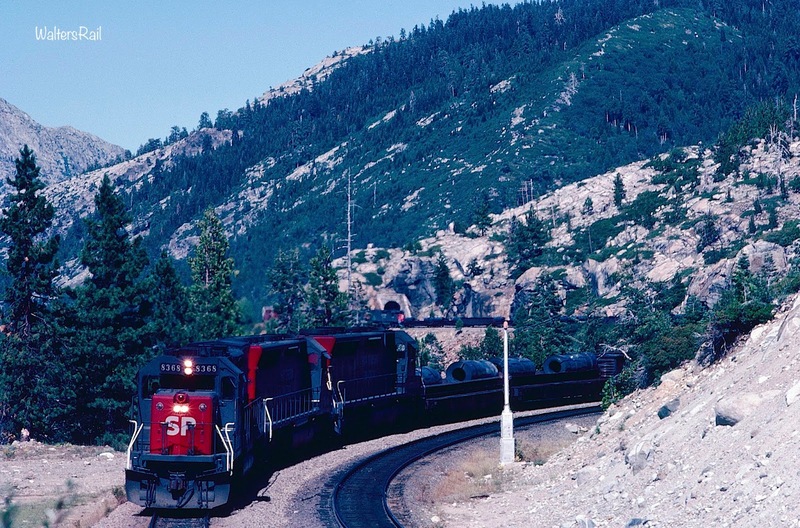 Freights commonly stalled or broke apart on the climb up the Toano Range, so planning and construction soon began on a better alignment with a maximum grade of one percent, which was completed in May 1914. 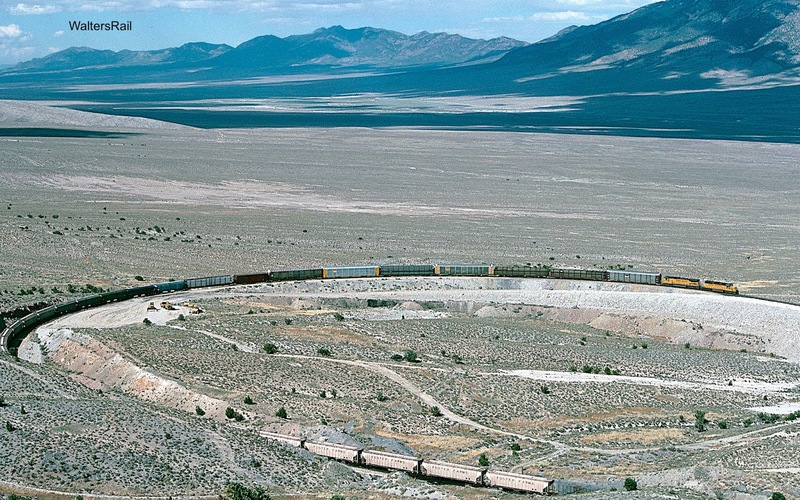 In the aerial photograph below, showing I-80 west of West Wendover, Nevada, you can follow the current path of what is now the Union Pacific as it slowly climbs the mountain on a northbound diagonal, then in the upper right of the image at Arnold Loop, abruptly reverses course on a one hundred eighty degrees horseshoe, continuing to climb on a southbound diagonal parallel to the lower tracks coming up from the south. Eventually, the tracks, on a significantly higher elevation, parallel the interstate highway until the road climbs to meet the railroad, which then ducks under the freeway and runs almost due west to the summit, sans tunnel, at Silver Zone. In the bottom of the photo, slightly south of I-80, the remnants of the original three-percent grade are still plainly visible. Westbound trailers are climbing the grade through Arnold Loop toward the summit at Silver Zone Pass. This quotation, as with much newspaper writing, dryly recites a list of dates, destinations and distances belying the underlying sound and fury that accompany internecine warfare. 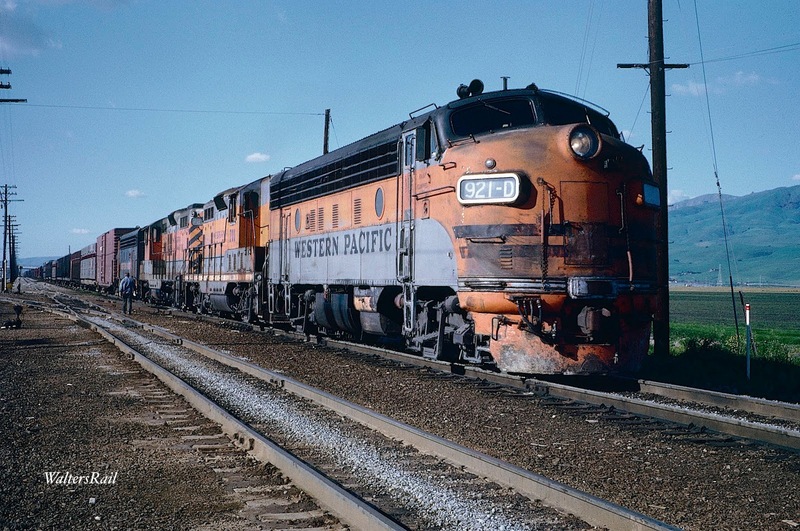 Constructed entirely in the twentieth century, the Western Pacific was one of the last major American railroads, operating always in the shadow of big brother Southern Pacific (originally the Central Pacific) and, like a younger brother, always trying futilely to outshine the rival. In the mid-19th century, Arthur Keddie explored the Feather River Canyon, 2000 feet lower than the Donner Pass route used by the Central Pacific, as an alternative passage east from San Francisco Bay to Chicago and the East. Keddie, often called the father of the Western Pacific, was born in Perthshire, Scotland on June 27, 1842, and moved to Ontario, Canada with his family when he was one year old. He served a three-year apprenticeship under a provincial land surveyor in Whitby, Ontario, and later passed his surveyor's examinations. In the fall of 1863, Keddie left Canada for the United States, arriving in California in September, where he found a job assisting in the compilation of George L. Holt’s map of California and Nevada. In 1864, he was sent to Plumas County to survey a wagon road and he decided to settle there. In 1867, he surveyed the Feather River Canyon for the Oroville & Beckwourth Pass Wagon Road Company, noted the small grade in the canyon and realized that building a railroad up the Feather River, instead of what became Donner Pass, might save money, manpower and rolling stock. Collis P. Huntington, builder of the Central Pacific, supposedly laughed Keddie out of his office after telling him that his dream of a railroad through the Feather River Canyon was a nightmare. “No man will ever be fool enough to try to build a railroad through that canyon,” Huntington supposedly said, ending the interview. "The advantages of this route consist in its low grades and a lower latitude of summit than upon the other routes; but it also presents disadvantages which render it next to impossible for us to avail ourselves of its advantages in this respect. It is eighty miles further from Sacramento to Fuller's crossing of Truckee by this route than by our present location. The Bald Rock cañon, about 20 miles above Bidwell's bar, is a rocky gorge in the Feather river, rising with smooth grain to sides almost perpendicular, being 3,000 feet high on the north side and about 2,500 feet on the south side, the length of cañon being about one and one-half mile. "In order to avail ourselves of the lower grades, it is necessary to run near the river, or at an elevation sufficiently high to be above high water. This renders necessary the crossing of all the ravines and tributaries, many of which run in gorges of great depth near their mouth, and also involves the necessity of curving up into them and running down again, in order to procure a suitable crossing. From Nelson's point to and through Bald Rock cañon, about fifty miles, the river runs in a gorge ranging from 2,000 to 2,600 feet in height, at a pretty steep slope, which, near the river where our line runs, in many places is perpendicular and generally rocky. The course of the river between these points is extremely tortuous and winding, the spurs of the mountain on either side jutting out sharply and running by each other, so as to lock across each other like the fingers of two hands thrust together. This involves the necessity of many tunnels. I estimated the number of tunnels upon this 50 miles at 28. The work of construction would, therefore, be vastly expensive and slow. 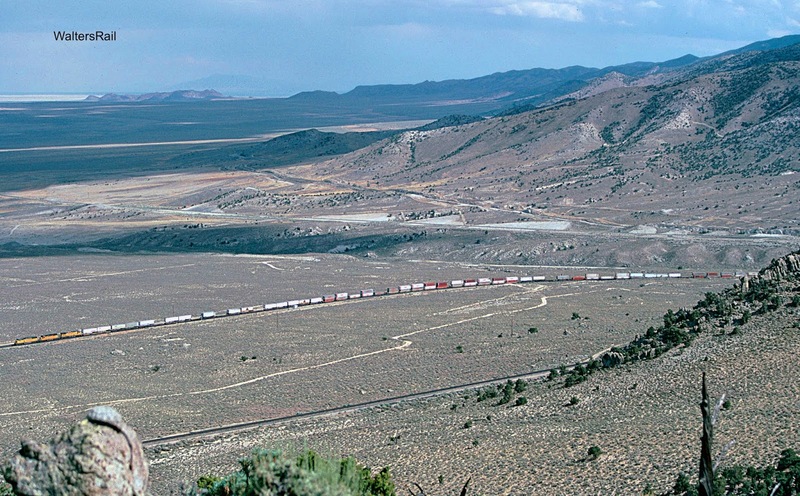 Trailers and double-stacks are climbing the grade to Silver Zone Pass after circling Arnold Loop on the track in the center right. 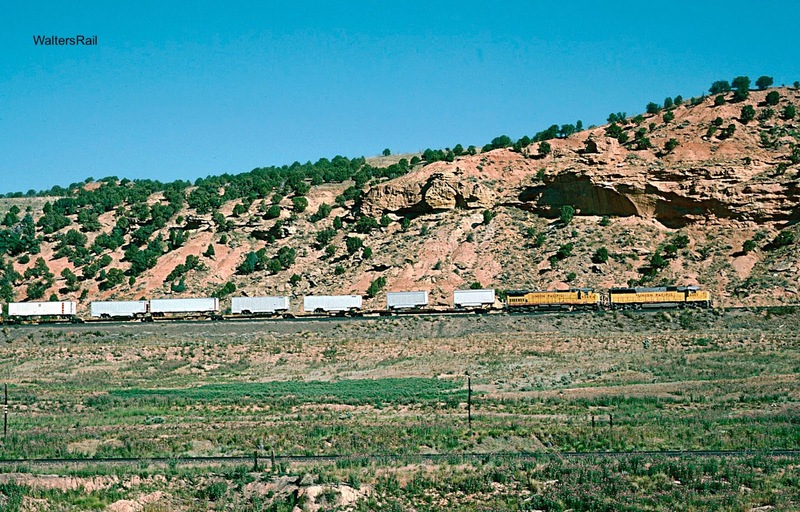 The head end of a westbound UP freight with trailers and auto-racks has run through Arnold Loop and is climbing the grade to Silver Zone Pass. The rear of the same train is on the lower track, approaching the loop. Thereafter followed political shenanigans all too common in the nineteenth century. Certain potential investors in a railroad -- to be called the Oroville and Virginia City -- convinced the California legislature to pass a law requiring Plumas County, California, "to subscribe to the capital stock of the Oroville and Virginia City Railroad Company the sum of two hundred and thirty thousand dollars, and to issue to said corporation the bonds of the county in payment of the subscription." The Oroville and Virginia City was to be constructed through the Feather River Canyon. Not surprisingly, the County objected. How could such a small, rural county be expected to raise the funds to support such bonds? The investors filed a lawsuit in California state court, seeking an order requiring the County to issue the bonds. The case appears to have been decided on legal technicalities peculiar to nineteenth century pleading and procedure. Suffice it to say that Plumas County prevailed. With the law compelling the supervisors of Plumas County to subscribe to the stock of the railroad and the incorporation now invalidated, the Oroville and Virginia City Railroad collapsed. Thus ended, at least for the time being, all hope for construction of a railroad through the Feather River Canyon. Arthur Keddie was forced to postpone his dream, but he did not forget it. 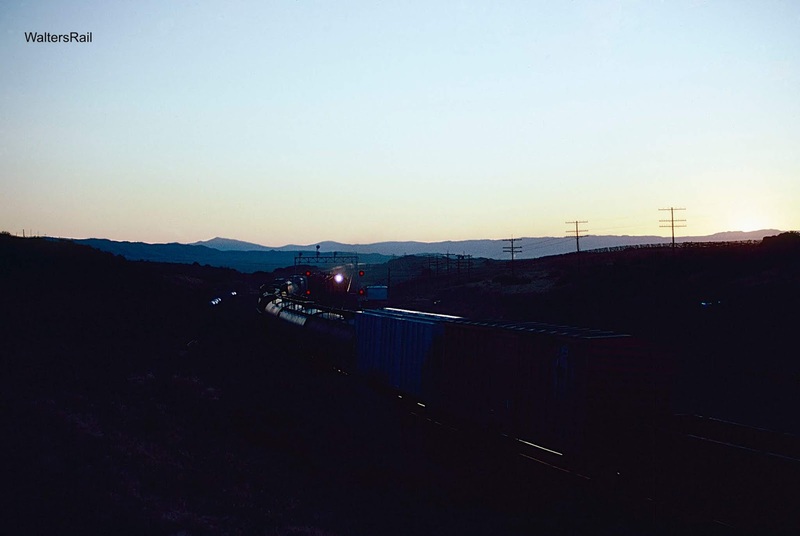 As the sun just peeks above the eastern mountains, a Union Pacific oil train is running parallel to the Toano Range on its approach to Arnold Loop. In 1900, Collis Huntington died, and Edward Henry Harriman, who already controlled the Union Pacific, also took control of the Central Pacific. Thereafter, the UP/CP refused to accept freight or passengers from the Denver and Rio Grande (owned by the Gould family), effectively cutting off the D&RG from the West Coast. Jay Gould's son George then decided to construct a separate line to San Francisco from Salt Lake City, bypassing the Central Pacific. In 1903, the newly formed Western Pacific Railroad was incorporated, an amalgamation of the Gould interests and financiers backing Arther Keddie, who was hired by the railroad to supervise construction and promoted to Assistant Chief Engineer in 1904. Construction methods had advanced noticeably since the building of the Central Pacific through Donner Pass. In addition, as Arthur Keddie had envisioned, and as Theodore Judah and Collis Huntington had failed to foresee, the line through the Feather River Canyon proved remarkably congenial to railroad passage. 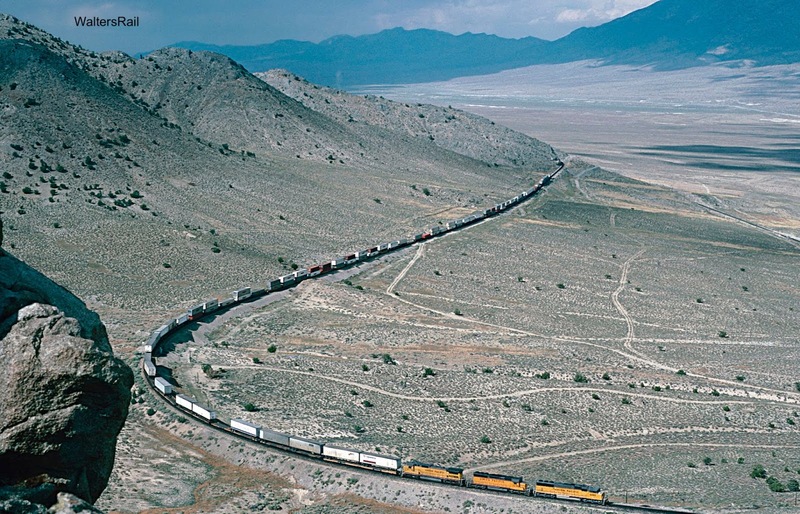 Thus, the entire line from Salt Lake City to Oakland was completed in about six years, a feat that few, and certainly not Judah and Huntington, had believed possible. Almost overnight, the Central Pacific (which became the Southern Pacific) faced competition. Like a master facing challenge from his apprentice, the Harriman empire first laughed. The Union Pacific was invincible! It was the transcontinental railroad. The Goulds were grasping at straws, spitting into the wind, gnawing at the feet of a giant. However, just in case the apprentice turned out to be more formidable than expected, the Southern Pacific filed legal challenge upon legal challenge, attempting to block the Western Pacific's access to the Oakland waterfront. Lawyers were deployed like land mines. Since I am a lawyer, I'm not sure I like that image, but it is probably accurate. In any event, the land mines proved ineffective against the nimble apprentice. By 1911, goods to and from the Far East (mostly Japan) were moving coast to coast on the Gould System, using the Western Pacific, Rio Grande, Missouri Pacific, Wabash and Lackawanna Railroads. Westbound trailers are climbing the Toano Range toward Silver Zone Pass. Arnold Loop is to the left of the image. 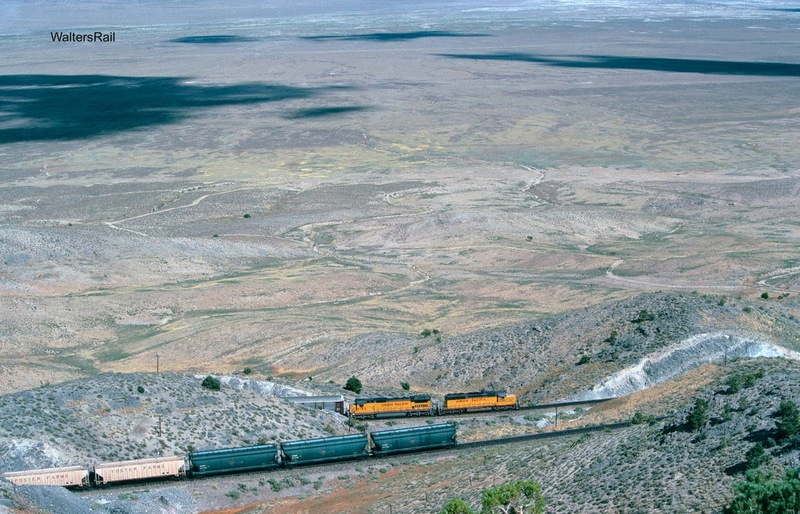 After circling the loop, the train will continue climbing the ridge on the track in the foreground. Silver Zone Pass is to the right of the image. However, there was crabgrass in the flowerbed. (Is that a bad analogy? Yes, but it's the best I can do. If you don't like it, substitute your own.) In this case, to obtain financing, the Gould interests pledged the assets of the Denver and Rio Grande as collateral for Western Pacific bonds. If the WP foundered, the D&RG would go down with it. Now the Western Pacific did not exactly founder, but like any new business, it needed time to establish itself. Given the unique financing arrangement, however, time was not on its side. Simply put, the WP did not generate enough profits to pay its bond obligations. It drowned in its own debt, which brings to mind images not worthy of further consideration. By the end of 1913, the Gould family had sold almost all of its stock and ownership in Missouri Pacific, D&RG and WP, in many cases taking a severe loss. With the stock becoming available, bankers for the Union Pacific began buying MP, D&RG and WP stock. 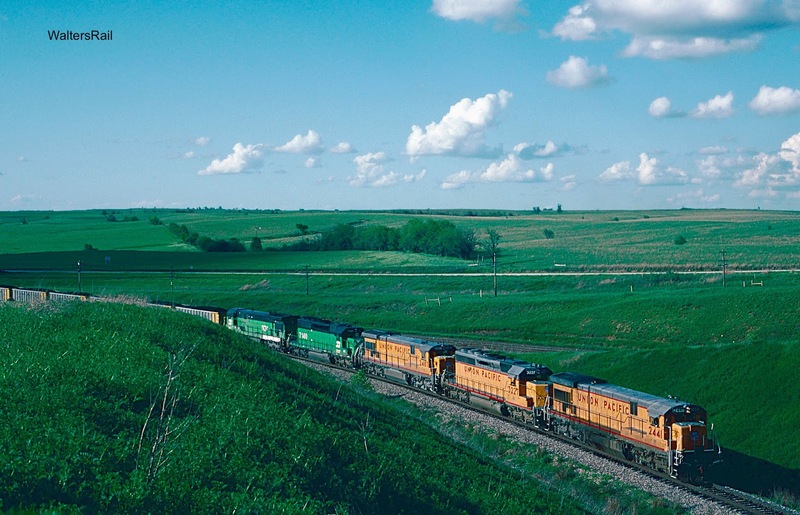 In short order, the Union Pacific's bankers held controlling interest in the former Gould railroads. An eastbound mixed freight is descending toward Arnold Loop. Here is the same train in the loop. Thereafter, the Western Pacific spiraled in and out of financial peril until finally plunging headlong into bankruptcy in 1935. After reorganization, the railroad made several attempts at profitability but was hamstrung by a lack of feeder lines. The WP depended entirely on traffic received from the Rio Grande -- a precarious existence, like a lawyer with a single client. 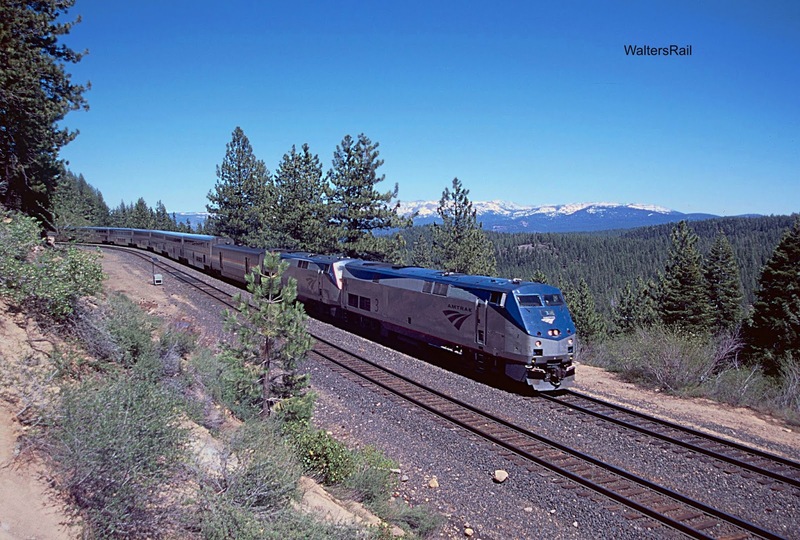 In 1949, the WP joined with the Rio Grande and the Chicago, Burlington and Quincy to introduce a streamlined passenger train between Chicago and Oakland, called the California Zephyr, long a favorite of railroad buffs and photographers because of its stainless steel observation domes. But the Zephyr, like so many other things on the Western Pacific, was a day late and a dollar short. By 1949, passenger traffic on American railroads was already in decline -- a decline that would become an avalanche in the next 20 years. WP discontinued the train in March 1970, though Amtrak has retained the name. Finally, inevitably, the gargantuan maw of the Union Pacific swallowed the Western Pacific in 1982, and by 1990, when the images in this post were taken, the route that Arthur Keddie built was being reduced, train by train, to its status in the twenty-first century -- a secondary main. 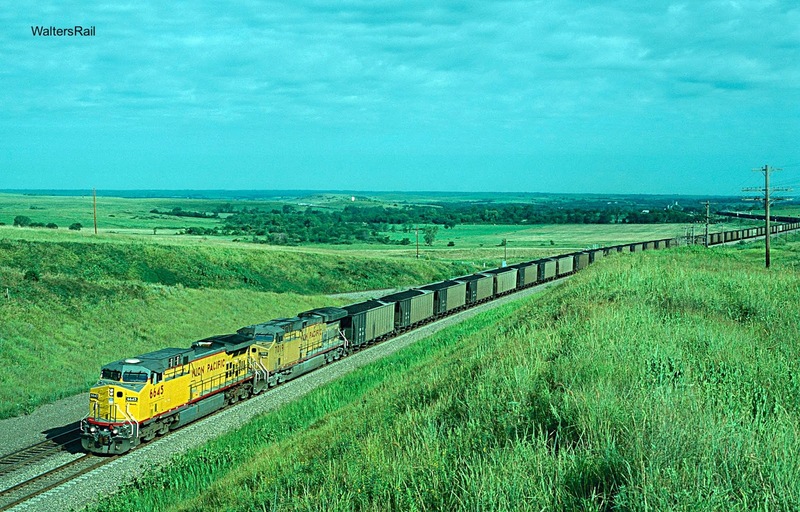 A loaded westbound coal train climbs the grade toward Arnold Loop. The power of an eastbound mixed freight has circled Arnold Loop and appeared on the lower track, while the rear end on the upper track is still approaching the loop. 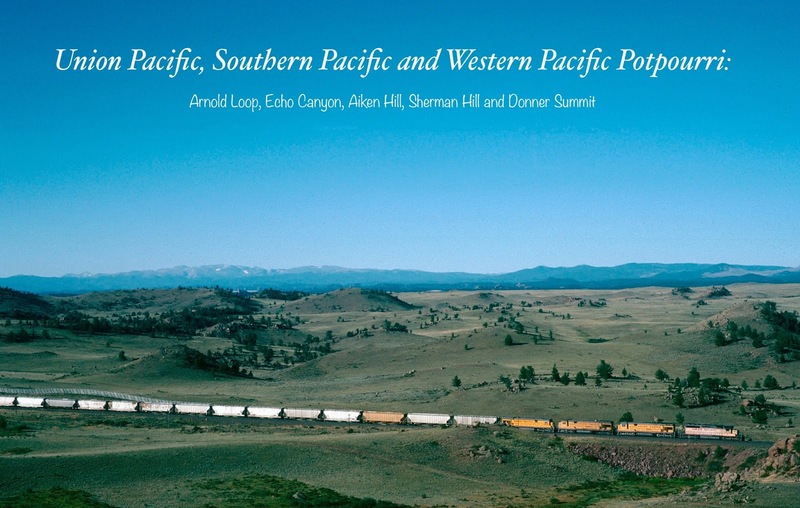 Although this post focuses on the Union Pacific, I am including three images from the old Western Pacific -- because these are the only presentable photographs of the WP that I ever took. I began railfanning shorty before I graduated from college in 1973. 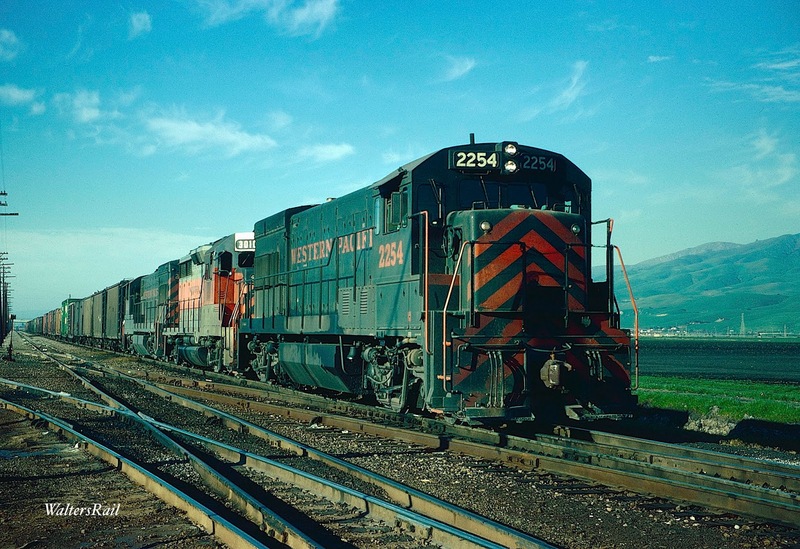 In the winter of that year, I twice chased WP freights from Stockton, across Altamont Pass, to Niles, California, home of Western Pacific's primary East Bay freight yard. My photography "equipment" consisted of a single, fixed-lens Argus C4 rangefinder. Although the camera offered shutter speeds as fast as 1/300 of a second, mine (for reasons I never understood) was stuck on 1/50th of a second. 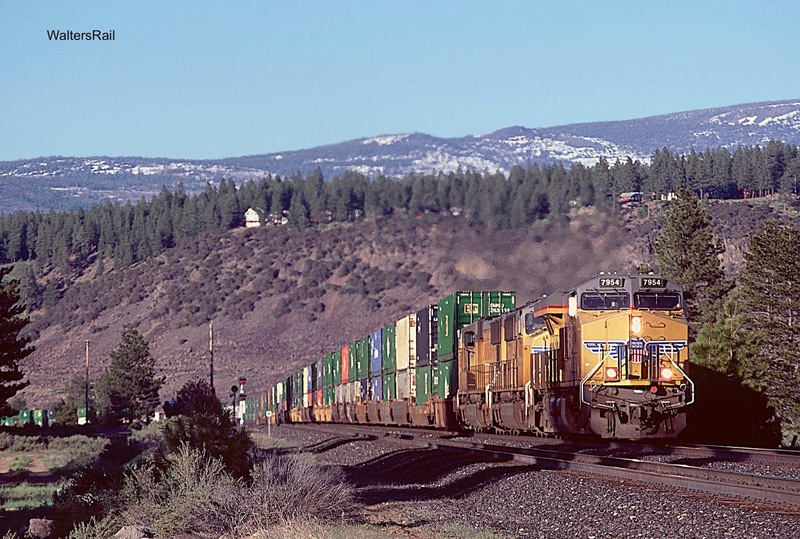 Consequently, all the shots of WP freights in motion were slightly blurred. I did manage decent shots of the two freights in the yard at Niles, plus an image of two GP-9 yard engines. I present them here without captions or further commentary. 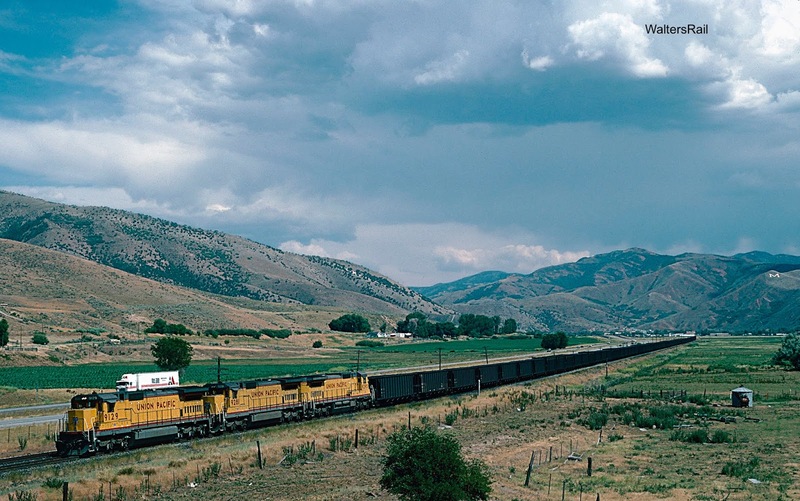 A previous post ("Union Pacific: Aspen Mountain to Echo Canyon") discussed in some detail the UP's passage downgrade to Ogden, Utah. The images in that post were all taken in the 21st century. 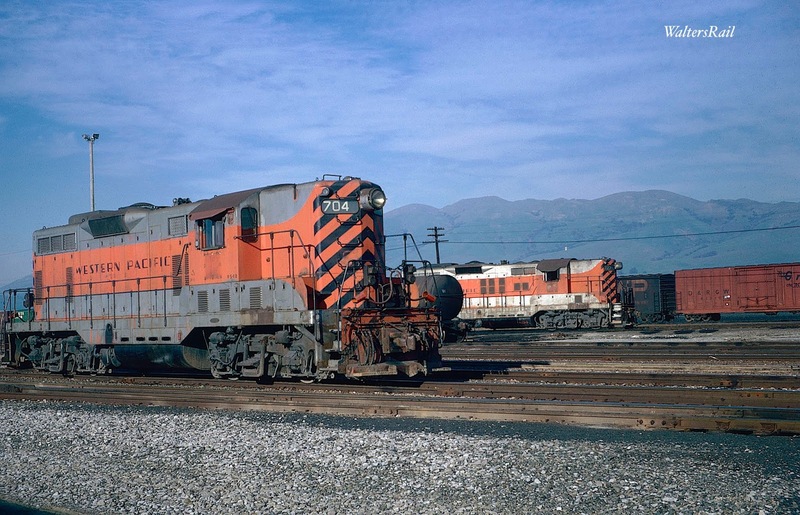 Here we concentrate on photographs from the late 20th century, when Union Pacific's engines were cleaner, and I was younger. If you have seen Echo Canyon, you will never forget it. If you have not seen it, nothing can prepare you for its magnificence. Beginning slightly west of the Wyoming border in northeastern Utah, Echo Canyon is the only route traversable by wagon from the east to the Great Salt Lake, and it is anything but tame. Sandstone walls, as stark and overpowering as the greatest cathedral's, rise on each side of a narrow defile that plunges spectacularly through the detritus of a long eroded mountain range. Native Americans used the route for centuries as part of an extensive trade network. Although the land is semi-arid, winter blizzards can settle over the canyon like the lid of a pot, reducing visibility to zero, threatening all life that has not found shelter. In the summer, late afternoon thunderstorms can explode out of an otherwise clear Western sky, with lightning bolts serrating the purple clouds like spears. Depending on the time of day and angle of the sun, the sandstone walls of the canyon can appear from light brown to blood red. Although Echo Canyon has seen myriad peoples traverse its massive slopes, I want to concentrate on one particular group at one particular moment -- the Latter Day Saints in the face of Johnston's Army. 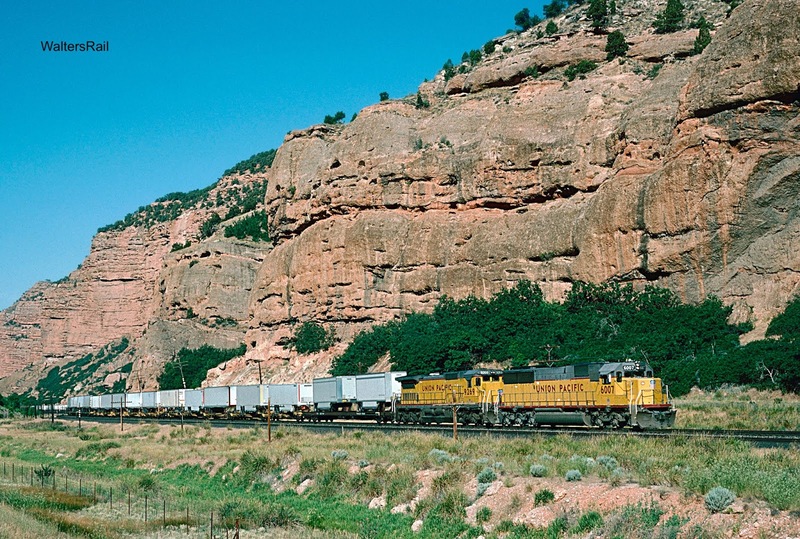 Eastbound UP trailers are climbing the grade in Echo Canyon beneath vertical sandstone cliffs. Echo Canyon extends roughly from Wasatch, Utah, to Echo Utah. 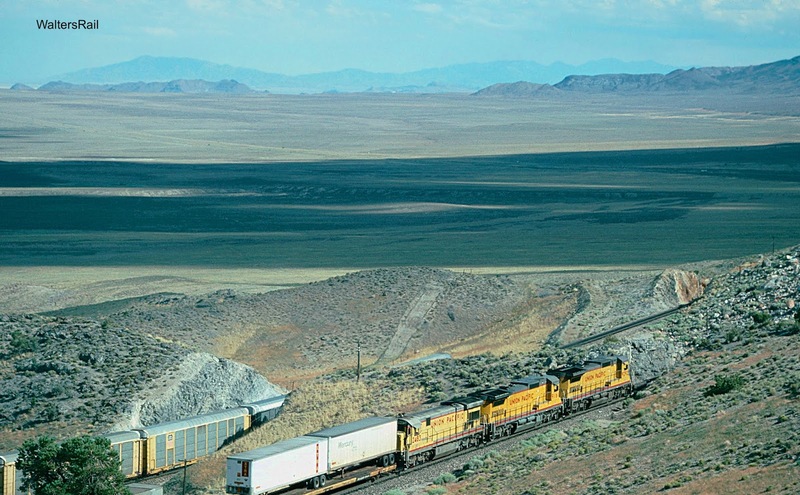 Both Interstate 80 and the Union Pacific Overland Route follow this narrow path toward the Great Salt Lake. 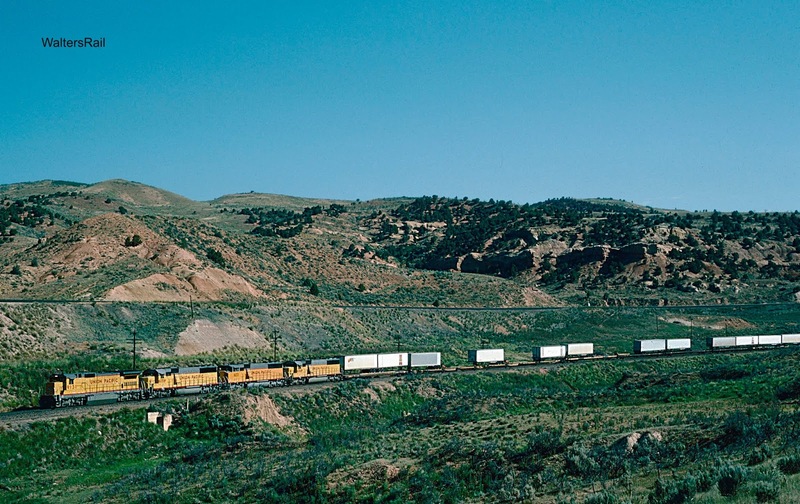 A westbound, loaded coal train glides downgrade through the bowels of Echo Canyon. In the 19th century, Brigham Young declared that an able-bodied man on the frontier could take more than one wife, provided he received prior approval from the Church of Jesus Christ of Latter Day Saints. Taking multiple wives was, to put it mildly, frowned upon by the rest of the country. Utah's attempts at statehood were thwarted for many years because of its refusal to ban this practice. Federal officials sent to govern Utah Territory complained mightily to Washington. I am greatly simplifying a contentious and complicated issue, but when it became clear that many in the Utah Territory were openly refusing to follow the dictates of federal courts and other authorities, President James Buchanan sent a replacement for Brigham Young as territorial governor, plus a large force of the federal army -- more than 2,500 men -- to ensure the new governor's installation and put down the "rebellion." "Their hostility to the lawful government of the country has at length become so violent that no officer bearing a commission from the Chief Magistrate of the Union can enter the territory or remain there with safety. . . . I accordingly order a detachment of the army to march for the City of Salt Lake — as a posse for the enforcement of the laws." — Proclamation of President James Buchanan. In reply, Brigham Young stated: "We are invaded by a hostile force who are evidently assailing us to accomplish our overthrow and destruction. . . . Our opponents have availed themselves of prejudice existing against us because of our religious faith, to send out a formidable host to accomplish our destruction. . . . [I order] that all the forces in said Territory hold themselves in readiness to march, at a moment's notice, to repel any and all such invasion." — Territorial Governor Brigham Young's proclamation, 1857. Westbound trailers are descending through the east end of Echo Canyon on the original UP single track line. The high line, with a shallower grade, was constructed when the route was double-tracked. "Should a collision take place between the good people of Utah and the detachment sent thither, the news of such an event would produce the most intense excitement throughout this vast confederacy, and the tide of public sentiment would set against us with tremendous force." — Utah congressional delegate John Bernhisel. Brigham Young heeded this advice and did not directly confront the federal force, headed by Colonel Albert Sydney Johnston. Instead, Young instructed his militia to harass the U.S. Army in a series of guerrilla raids, the first of which was a comic fiasco. Several militiamen attempted to stampede and steal a herd of Army mules near the western Continental divide at South Pass, Wyoming. An alert and ingenious Army bugler, however, blew "stable call," which to the mules meant "food!" Not only did all the Army's mules return, so did the militia's mules, leaving the raiders to ride back to Utah alone. 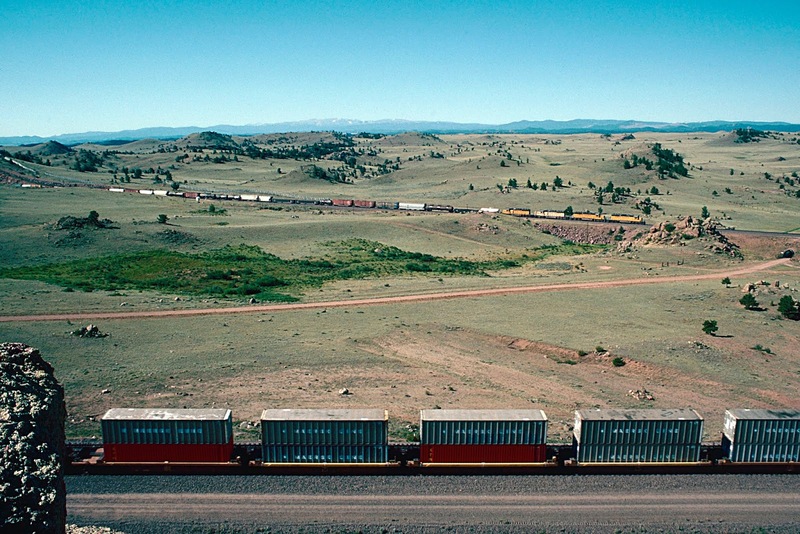 Eastbound trailers are approaching Wyoming. Events soon became more serious. Lot Smith, a militia leader, and his men burned 50 federal wagons in two detachments on October 3, 1857. The next day he burned another unprotected train, after a short conversation with the wagon master. Smith asked him to get all of his men and their private property as quickly as possible out of the wagons. "For God's sake," the wagon master replied, "don't burn the trains!" Smith replied that he could either shoot the federals or burn the wagons, and his orders were to burn the wagons. Events like this were why the Latter Day Saints would later claim to have fired no shots at the Army. (The Army claimed otherwise). One of Smith's men did fire a shot by accident just after that wagon burning. Smith recalled how it hit three of his own men. He wrote: "The heavy ball passed through Orson P. Arnold's thigh, breaking bone in a fearful manner, struck Philo Dibble in the side of the head, and went through Samuel Bateman's hat just missing his head and pulling his hair." 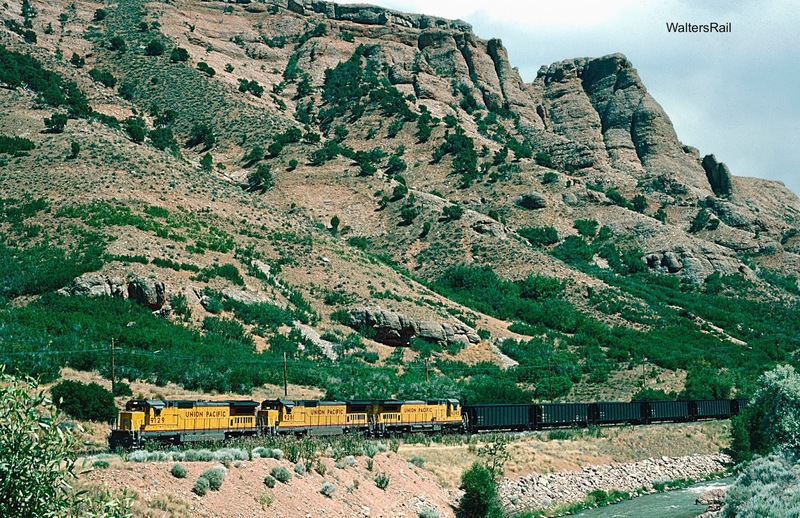 An eastbound, empty coal train is roaring compass southeast through the Henefer Valley, approaching the western beginning of Echo Canyon. Winter comes early through Echo Canyon. By November, the Latter Day Saints hoped to ambush the Army at a point where the canyon narrows about a mile east of the current rest stop on Interstate 80. Circular rock nests still sit atop the cliffs on the north side. On south, the militia dug rifle pits, now long-vanished. Had the Army advanced, it would have been surrounded. Across the canyon floor, the Mormon militia dug multiple trenches — about 12 feet wide and eight feet deep — to slow the Army's advance. Dams were also constructed to flood some of the narrowest passages between the sandstone cliffs. The Mormons manning such fortifications did not have an easy winter. A captured Army teamster later wrote that among Mormon troops, "remnants of old bed quilts and blankets served as overcoats." Many men had no shoes and no tents. Westbound stacks glide downgrade near the spot where the Latter Day Saints constructed fortifications to ambush the U. S. Army. The press began to lambast Buchanan for the affair's cost and ludicrousness. One political cartoon showed Brigham Young hiding behind multiple wives — which it called his "breastworks" — scattering the Army into a frenzy with well-placed shots. Buchanan started looking for a way out of the mess. Colonel Thomas Kane, a longtime unofficial ambassador for Mormons in Washington, was authorized by Buchanan to travel West to negotiate peace. Buchanan eventually offered amnesty to the Latter Day Saints in exchange for the establishment of a permanent Army fort: Camp Floyd in Cedar Valley. Johnston wasn't happy. He later said that he "would give up his plantation for a chance to bombard the city [Salt Lake City] for 15 minutes." At least 98 men who would become future Civil War generals — 50 confederates and 48 for the Union — served in at least part of the "Utah Expedition," or at the Camp Floyd it created. Johnston was one. He commanded all western Confederate forces and was killed at Shiloh. First, we start with a mystery. Immediately below is the Google Maps image of the area where the following photographs were taken. In the middle of the image is a place name: Aikins. The state is Kansas; the county is Pottawatomie. 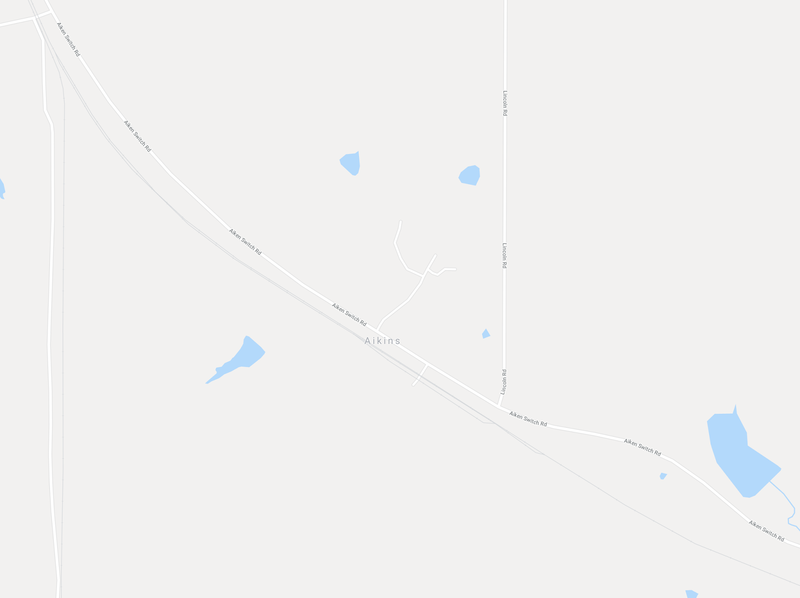 Union Pacific's double-track mainline (the Marysville Subdivision) curves from southeast to northwest through the image. A dirt road -- called Aiken Switch Road -- follows slightly north of the tracks. 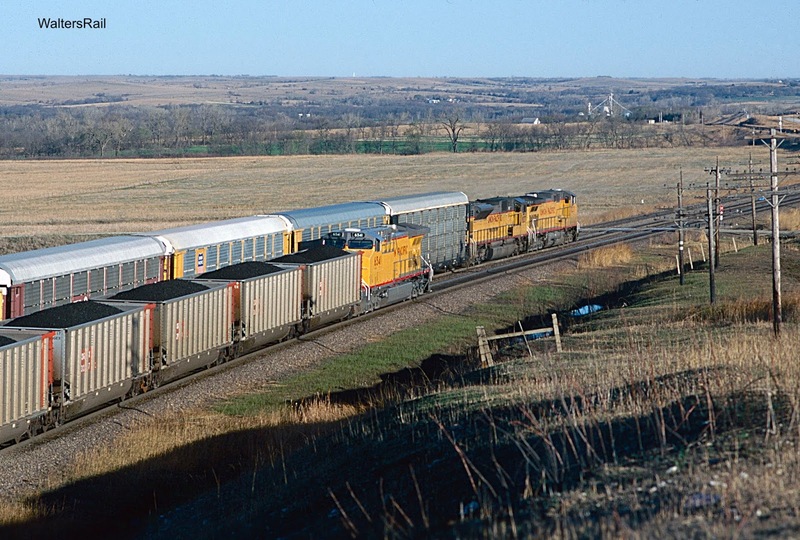 Southeast-bound, loaded coal trains struggle up a significant grade at this location. Is this Aiken Hill, or Aikins Hill? Before the line was double-track, the siding at this location was called Aiken. I do not know where the name "Aikins" came from. As far as I know, there has never been a settlement there. I went to grade school with a boy named Aikins who was as dumb as a brick; I don't think he ever lived in Kansas. If you do a Google search for Aikins, Kansas, you will be directed to the map above. That's all I can tell you. I have always called this location Aiken Hill. If you want to call it Aikins Hill, go right ahead. 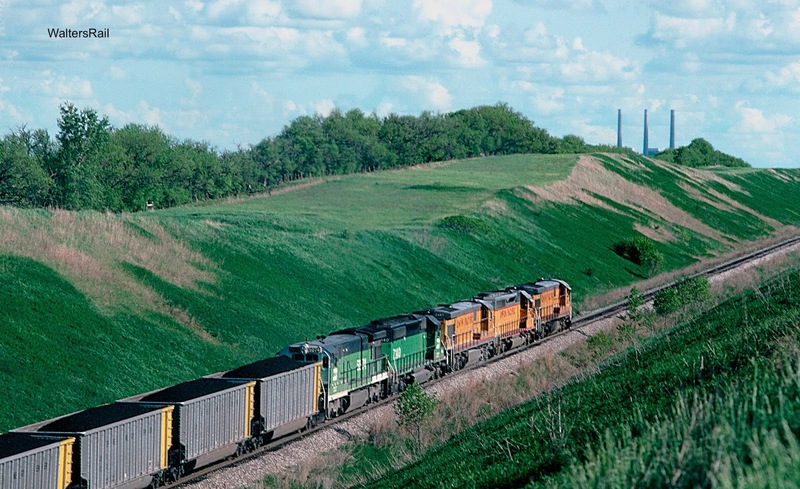 An eastbound coal train, headed to Kansas City and points south, is struggling into the grade at Aiken Hill. In northeastern Kansas, about 85 miles northeast of Kansas City, Aiken Hill is on the very eastern edge of the Flint Hills, a geologic formation running from northern Kansas south into northeastern Oklahoma (where they are called the Osage Hills). The scenery in this portion of the mid-continent is beautiful -- flowing, rounded hills covered with bluestem grass and trees in the bottomland -- especially when everything turns dark green after rainfall. These hills were created by the erosion of limestones and shales formed during the Permian Period (about 286 to 245 million years ago) when what are now Kansas, Oklahoma and surrounding states were covered by a shallow sea. Millions upon millions of marine animals lived and died in those ancient waters, their shells dropping to the bottom and collecting over the centuries to form limestone which in present day Kansas, unlike almost anywhere else in the world, contains bands of chert (also called flint). Because chert dissolves much more slowly than limestone, the erosion over the ages has left behind a clay soil full of rocky gravel, making the land more suited to ranching than farming. Today, the Flint Hills are covered by native grasses that have grown here for centuries, making this land the last great preserve of tallgrass prairie in the United States. In winter, a single pusher shoves loaded coal up Aiken Hill while loaded auto-racks glide downhill on the far track. 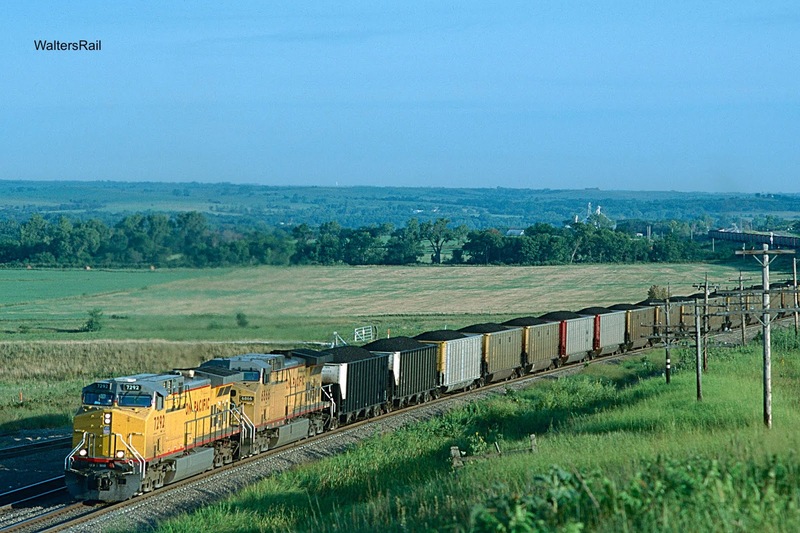 A westbound, mixed freight is passing a loaded coal train at the summit of Aiken Hill. When you stand at the summit of Aiken Hill, your view from southeast to northwest is unimpeded by trees. Broad hills unroll before you like dumplings, and the wind through the tall grass sounds like water flowing in a shallow stream. Trains in both directions can be heard for miles. Sometimes, when the air is still and the sky transparent, I can almost believe that I have been transported to the 19th century. I say "almost" for two reasons. First, trains roaring across the hills are pulled by diesel-electric locomotives that likely would have frightened 19th century citizens and horses to death. Second, if I turn and look due south, I see three smokestacks of one of the largest coal-burning, electric-generating plants in North America. The Jeffrey Energy Center came online in July, 1978 -- when the United States was suffering from skyrocketing oil prices.-- and was considered the model by which the country could obtain oil independence from the Middle East, burning domestic coal rather than imported oil. Vice President Walter Mondale gave a speech -- which I am glad I did not have to sit through -- at the plant's opening, and a special train carried company officials and various politicians from Topeka, Kansas, up Aiken Hill to the new generating station. 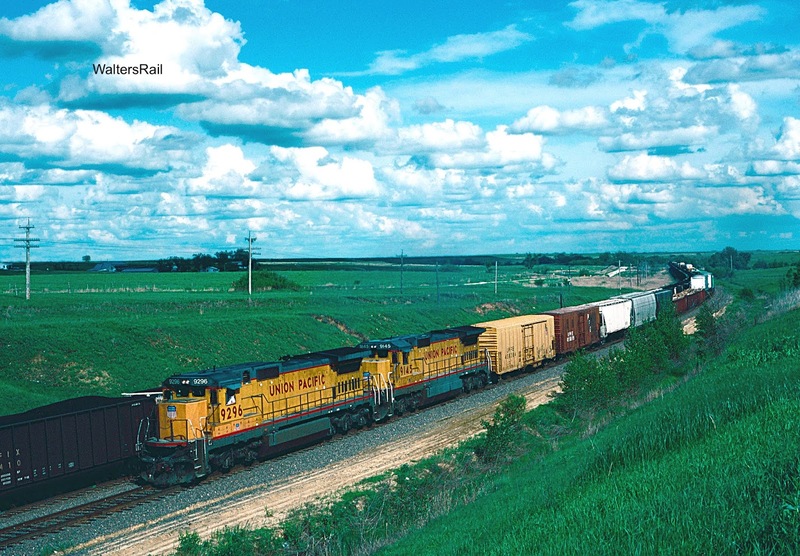 The plant is reached by a spur track running due south through a deep cut up the side of one of the Flint Hills. I would have loved to have been there to watch the construction. A loaded coal train has departed the main line on its way up the spur track to the Jeffrey Energy Center. The same train is shown climbing the hill to the triple smokestacks. The generators and steam turbines at the Jeffreys Energy Center were imported from Germany, which makes me wonder exactly how advanced is American engineering. Even more humorous, the unit two intermediate pressure turbine had to be replaced by the unit three turbine when the original unit was lost on a ship that sank while crossing the Atlantic. My father was a long-time attorney for Oklahoma Gas and Electric, the main electric utility in central Oklahoma. When he would come home from work in the evening, he would stop just inside the front door and turn on the light switch to the chandelier in the foyer of our house. I once asked him why, and he replied, "I'm always amazed that, when I turn on the switch, the lights come on." I am a long-time attorney for AT&T. Don't ask me what I think about dial tone. An eastbound, loaded coal train is struggling up the grade at Aiken Hill. Another loaded coal train attacks the hill. Much of Sherman Hill is off limits today. As of the date of this post (July 2018), landowners and the Union Pacific have joined forces to ensure that anyone venturing off public roads will accosted either by railroad police or a deputy sheriff from Cheyenne, or perhaps both, and quite possibly placed in jail. I know that sounds extreme, but trust me. This area is still worth a visit, but unless you are braver than I, stay on public property. Eastbound UP auto racks are descending Sherman Hill beside one of the many monadnocks rising from the surrounding plains -- called the "Wyoming Gangplank" by geologists. If you drive both Interstate 70 west of Denver and Interstate 80 west of Cheyenne, you will be surprised by the difference in terrain. 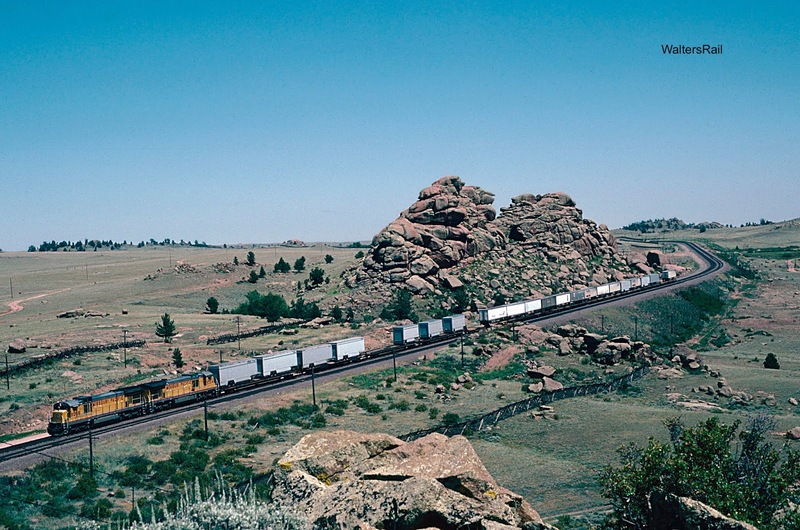 West of Denver, the Front Range rises like a fence, and the highway climbs the mountains in a torturous path that brings most trucks and many autos to their knees. West of Cheyenne, on the other hand, the road rises gradually as the surrounding terrain slants upward, as though you are driving up a large sheet of plywood that has been raised slightly from east to west. In effect, the Rockies stop at the Colorado/Wyoming border, as though a large hand pressed down from the sky and flattened the mountains. What actually happened is that a piece of the High Plains escaped erosion at the mountain front and extends upward to the granite peaks of the Laramie Range. This area is called the "Gangplank," because it is the only place along the Rocky Mountains where, if you have the stamina and desire, you can walk all the way to the summit without climbing. 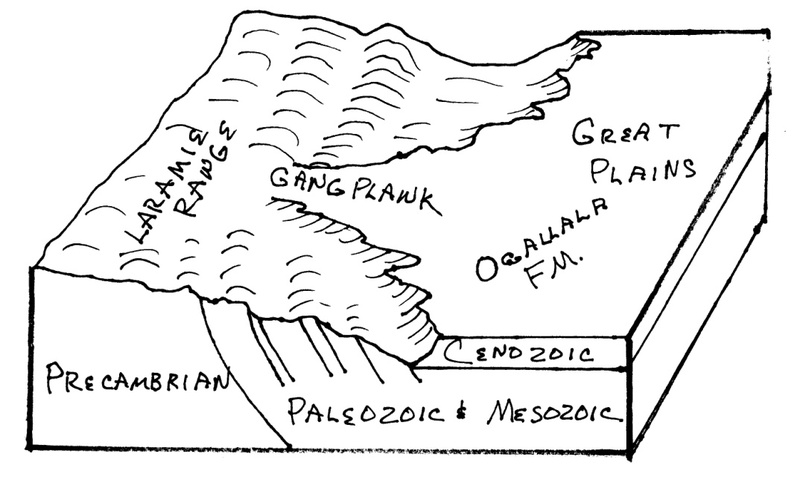 Following is a diagram of the Gangplank, taken from the following link, which contains a marvelous discussion of this geologic oddity and is well worth the read: https://csmsgeologypost.blogspot.com/2013/08/the-gangplank-transcontinental-railroad.html. Below is an aerial image of the Grangplank. Notice how the mountains to the south and north seem to flatten when the High Plains rise to the summit. 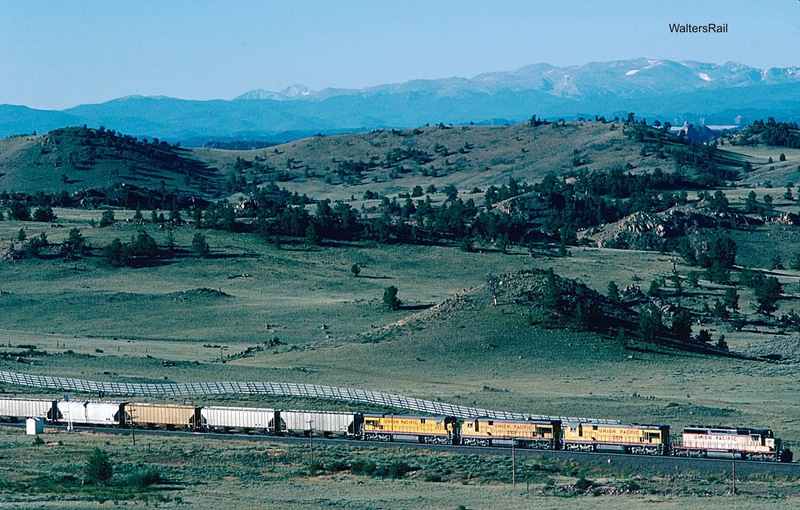 Interstate 80 follows the Gangplank to the north until crossing the peaks of the Laramie Mountains. 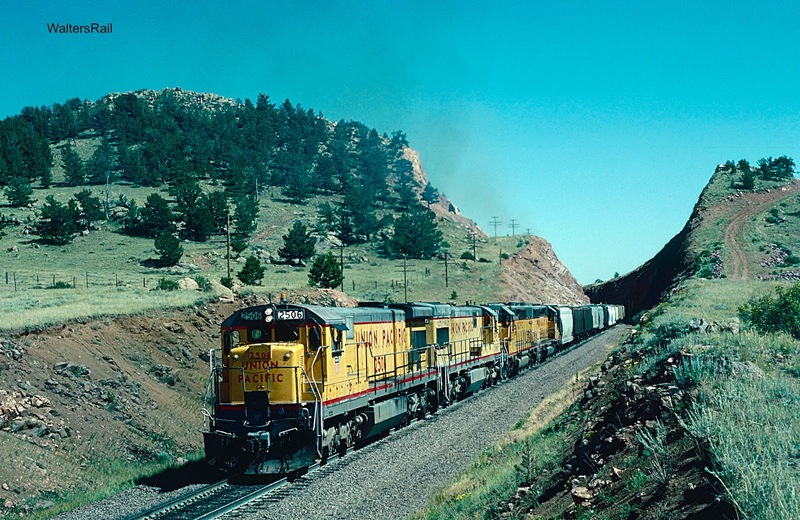 At Buford, the original UP mainline heads southwest and crosses the summit while still on the Gangplank, continues running downgrade to Tie Siding, then runs northwest through the Laramie Valley to its namesake. Track 3 runs significantly south of the original mainline before turning north to rejoin the mainline near the crest. 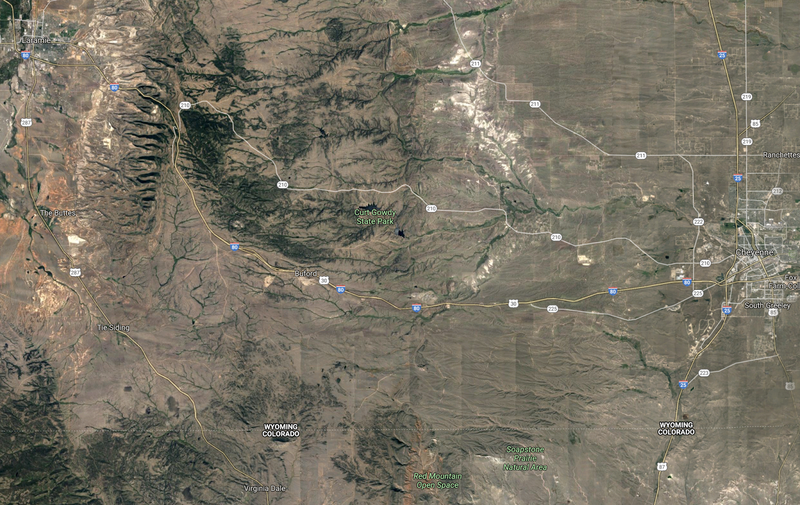 If you know where to look, you can see Track 3 making a series of huge curves just southwest of Cheyenne and just north of the Colorado border. Eastbound trailers are rolling down the Gangplank. Notice the snow fence below the tracks. This is an area of fierce winter winds, where snow can drop visibility to zero. A westbound grain train is climbing the Gangplank. In the distance to the south rise the Rocky Mountains of Colorado. 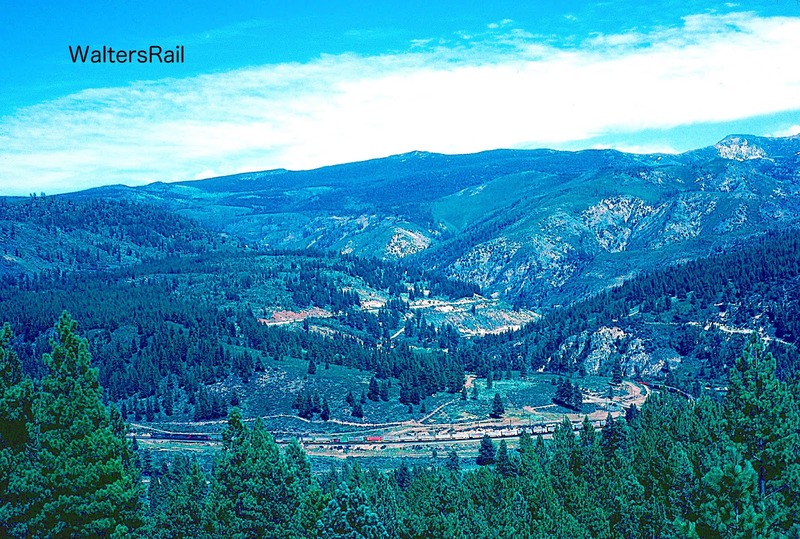 This route across the Rocky Mountains was discovered by Grenville Dodge, a Union general in the Civil War and later the Chief Engineer for the UP. Theodore Roosevelt once stated to Dodge: "I would rather have had your experience in the Civil War and have seen what you have seen and done than to be President of the United States." Dodge and his surveying party were exploring west of Cheyenne. Dodge and part of the group rode west to explore an area near Crow Creek while the bulk of the party stayed behind. At some point, the smaller group stumbled upon Native American hunters. To avoid detection, Dodge and his men dismounted and began to walk back toward the remaining survey party to the east. Expecting to climb down off the escarpment from the Laramie Mountains, Dodge instead found a moderate slope that led all the way back to Cheyenne. 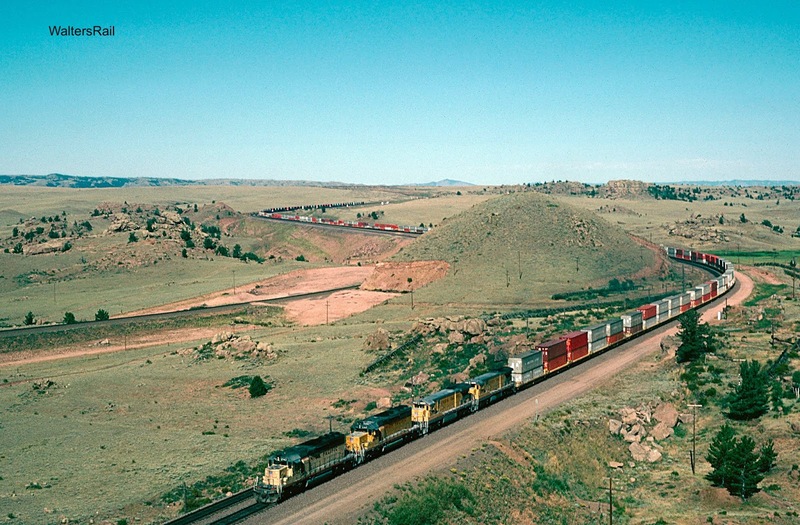 He realized then that he had discovered the Gangplank -- the route for the Union Pacific to cross the Laramie Range. 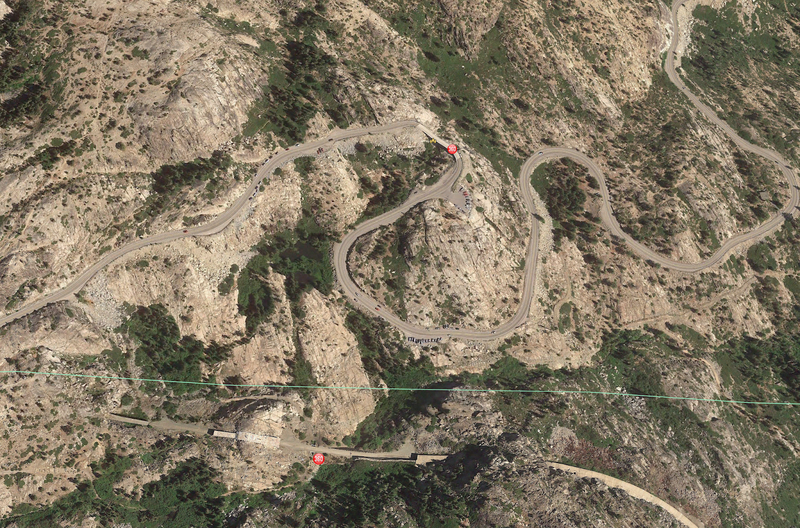 The original route of the UP crossed the summit at Sherman, Wyoming -- named for Union General William Tecumseh Sherman. 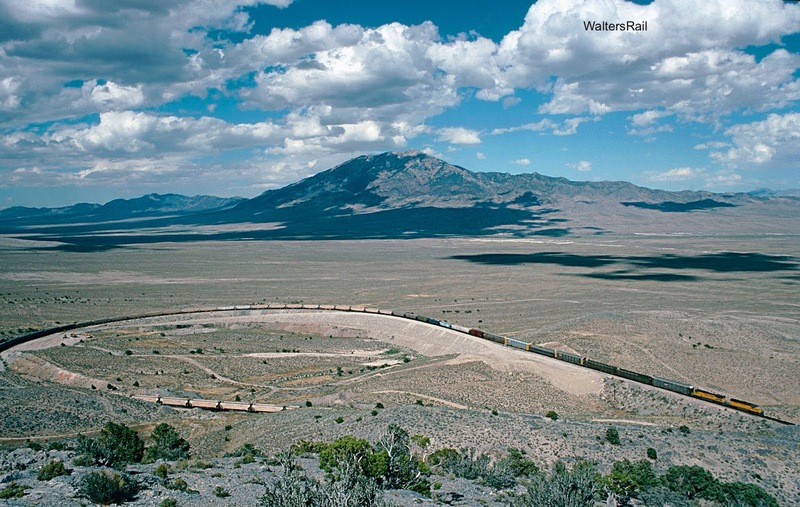 At 8,247 feet, it was the highest point on the first transcontinental railroad. A small settlement of a few hundred people was established, but fierce winter weather discouraged most from living there year-round. Trains in both directions were inspected before beginning the long descent from Sherman Pass summit, either east to Cheyenne or west across the 130 feet high Dale Creek Bridge to the Laramie Valley -- the highest railroad bridge in the world at the time of its construction in 1868. 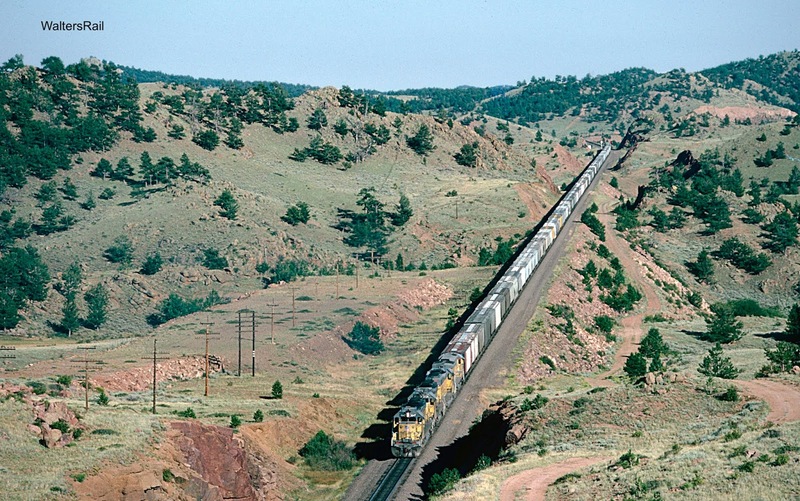 Several years later, the UP relocated the line across the Laramie Range to a point about 3 1/2 miles southeast of the original crossing, at a slightly lower elevation of 8,014 feet -- and the Dale Creek Bridge was abandoned. 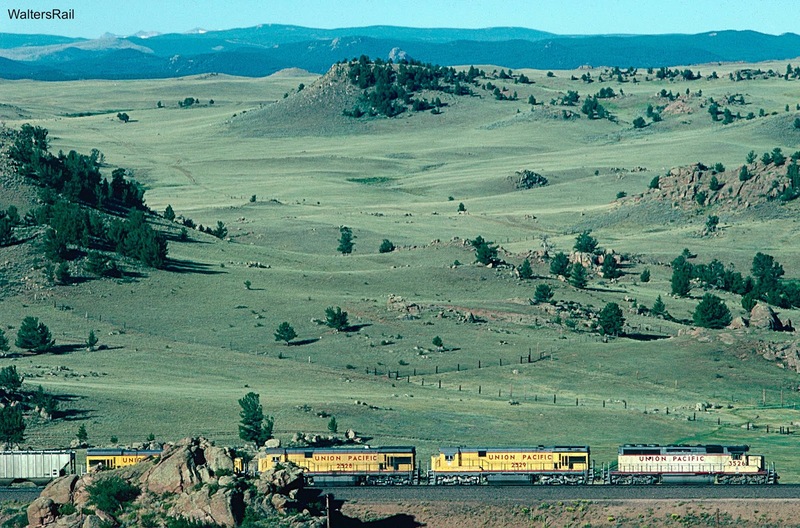 Interestingly, although this new point is still the highest on the Union Pacific, it does not mark the crest of the mountains and the beginning of the descent to Laramie. 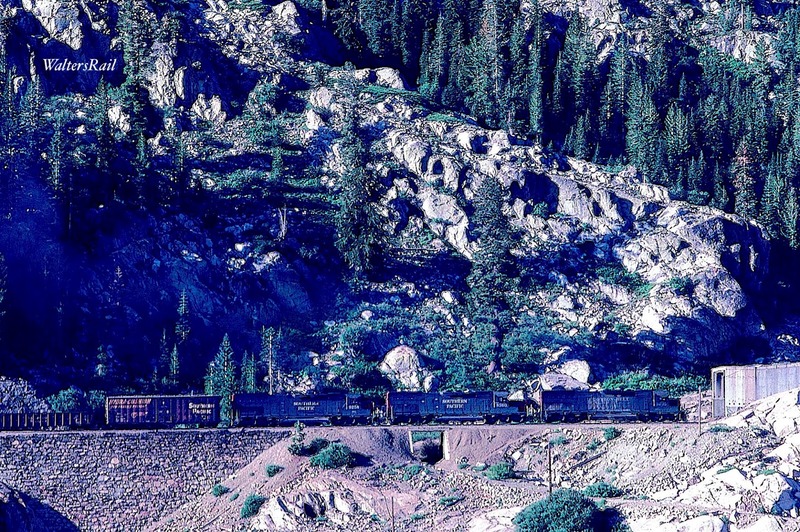 Instead, from this location, trains roll downgrade a short distance, then upgrade again to the start of the long downhill run -- at Hermosa Tunnel at the slightly lower elevation of 7,960 feet. 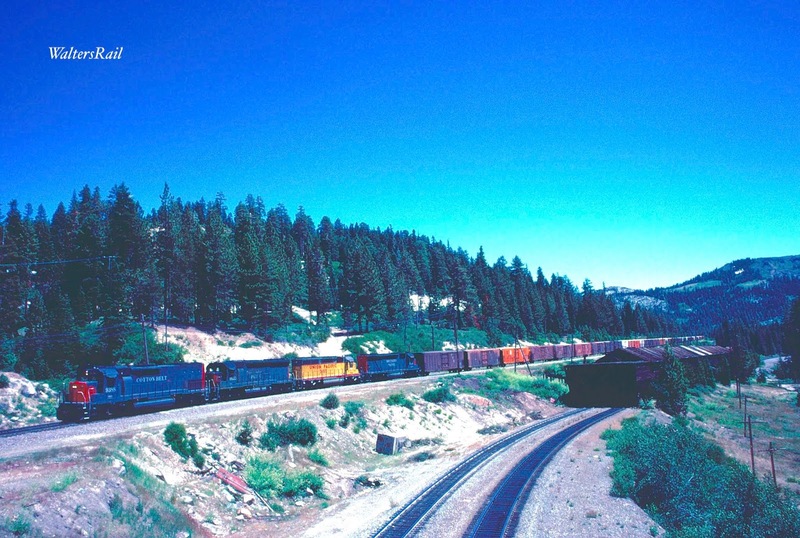 A westbound UP manifest approaches Hermosa Tunnel as it passes eastbound tonnage -- sundown of August 12, 1987. The 1.5% westbound grade up Sherman Hill challenged the UP for decades. The "Big Boy" steam locomotive --the largest ever constructed -- was designed specifically to attack this grade. Years ago, I read a story about German prisoners of war who, in the early 1940's, were being transported by rail to their place of internment. The prisoner train stopped for refueling in Cheyenne, Wyoming, where the soldiers were allowed to de-train to stretch their legs. One soldier later wrote that when he saw a Big Boy rolling through the freight yard, he realized that Germany could never defeat a nation building steam locomotives that gigantic. 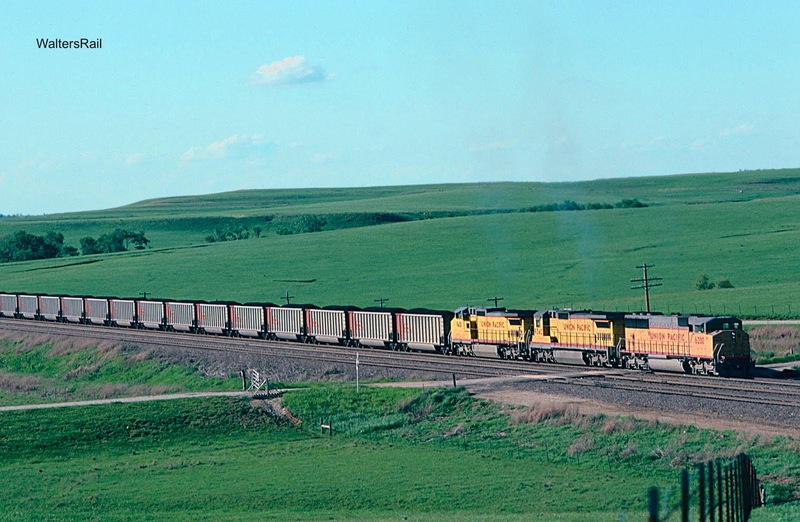 In 1953, the Union Pacific built a third track over Sherman Hill nine miles longer but with a significantly shallower grade. 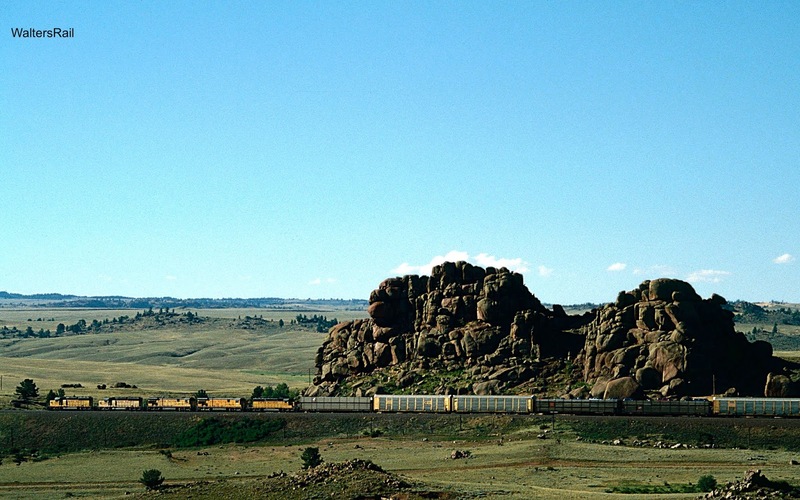 The Number 3 track passed through Harriman, Wyoming, named for Roland Harriman, son of E.H. Harriman. A westbound grain train is climbing the Number 3 track. Here is another grainer on the Number 3 track. Eastbound double stacks are descending the Gangplank toward Cheyenne. In the center of the image is the Number 3 main approaching the original grade. In the background, a westbound UP manifest is climbing the grade on the Number 3 Track toward Hermosa Tunnel, while in the foreground, double stacks roll downgrade on the original mainline. A visit to Sherman Hill is worth the effort, even if many of the best photographic locations are no longer accessible. The trip is worthwhile if for no other reason that to see the Gangplank, one of the most unusual geologic formations in North America. Most people driving cross country on I-80 are not even aware what they are looking at. But now, you will be. A UP grain train is climbing the Gangplank. If you stand in Reno and look west to the Sierra Nevada, the route chosen by the Central Pacific makes perfect sense. 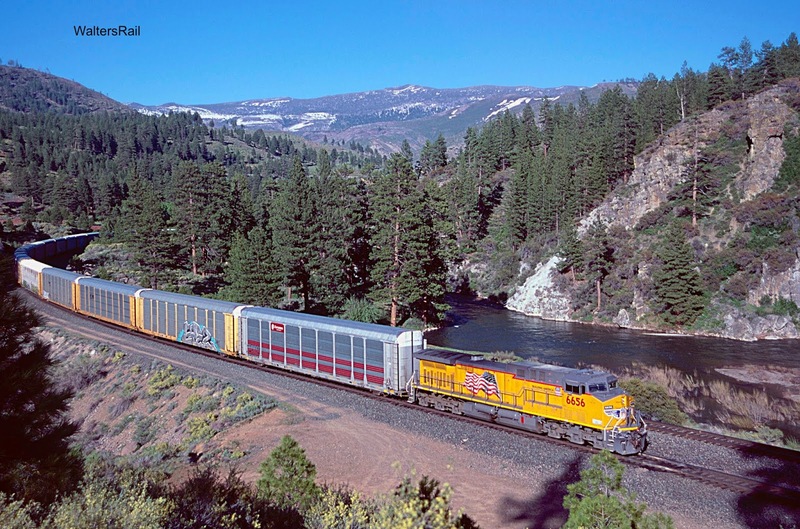 The railroad follows the Truckee River through a canyon carved in the granite wall that rises from the surrounding terrain like the open lid of a trap door. The grade and curves are manageable all the way to Truckee, California, which sits in a broad valley that looks up to a summit several thousand feet above. The ridge to the top, however, is almost perpendicular -- very similar to what you see on the Moffat Route looking west up the Continental Divide to Rollins Pass. The difference is that the distance under the divide is about six miles to a comparable elevation on the western slope. At Donner Lake, which sits at the base of the mountain, elevation approximately 5970 feet, a tunnel boring west would travel about 15 miles before reaching a comparable elevation on the western slope. Thus, tunneling was not an option. The only route to the top was up the side. 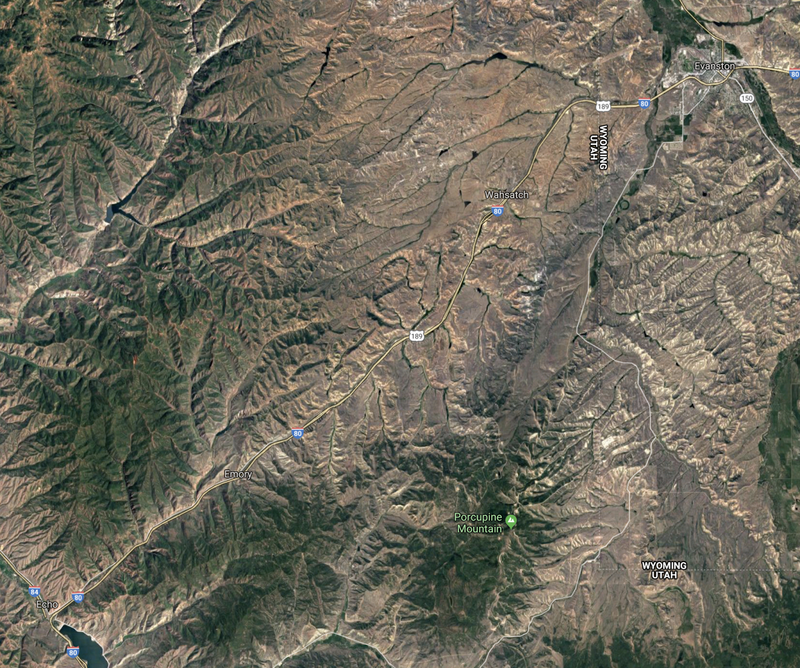 This is what stranded the Donner Party and why construction of this portion of the line was so tortuous. 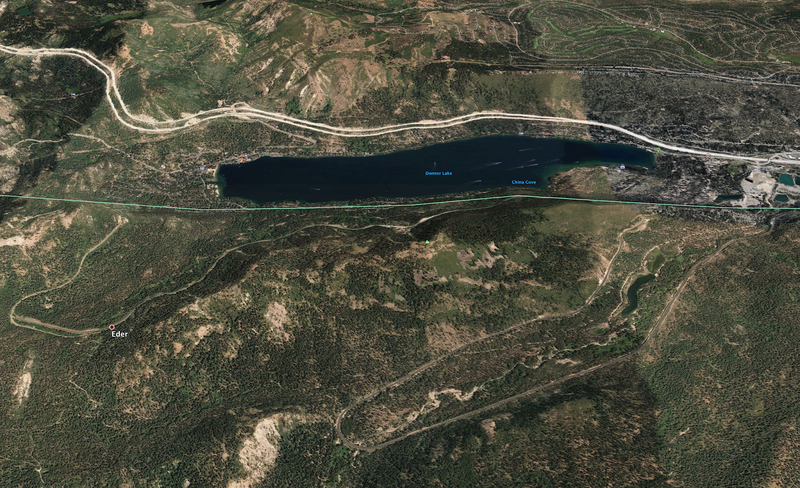 In this aerial image, we see the western edge of Truckee, California, in the upper right. We also see the Donner Summit line running northeast to southwest, climbing steadily, then making a horseshoe and heading back northeast. The line makes another horseshoe inside a tunnel, still climbing, then emerges to run due west before turning southwest to Eder. The mainline then enters another tunnel which UP dispatchers call the "Big Hole" -- drilled after construction of the original line, because snow in this area is incredibly deep and harsh. The photograph also shows the path of the original line turning back to the north. 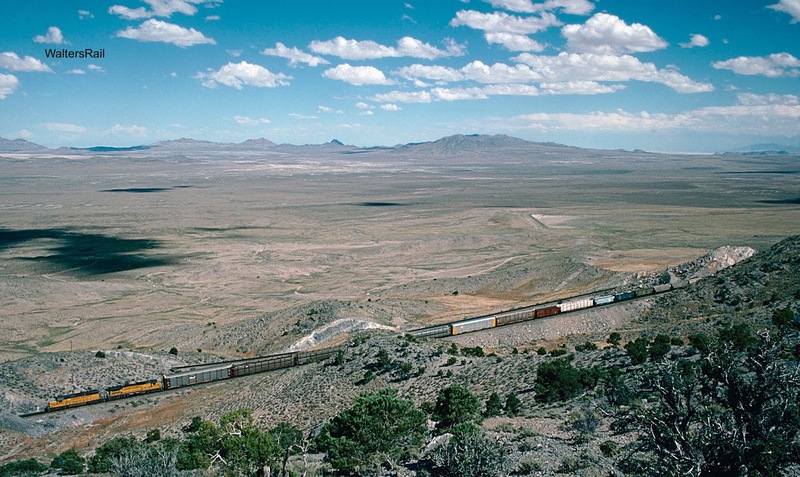 This track was abandoned years ago when the Rio Grande bought the Southern Pacific. This image is immediately west of the preceding one and shows the Big Hole tunneling beneath Mount Judah, named for Theodore D. Judah, the primary surveyor for the Central Pacific. On the west, the Big Hole emerges just beneath the Snow Bowl ski resort. This image shows clearly how the original line curved around and up the north side of the mountain, reaching the summit at Norden. Because of the heavy snows, most of that line was covered by a series of concrete snow sheds creating the effect of a tunnel where none had existed. Many years ago, the snow sheds at Norden were made of wood and looked like something constructed by Vikings. Years later they were replaced by concrete sheds. That old line has been abandoned, and most of the concrete sheds now stand empty, although the single track that still remains uses part of the concrete shed at the summit. I have seen a few hikers coming out of the sheds. I don't know if the Union Pacific polices the area or not. At Norden, you can see U.S. 40 running east and criss-crossing down the face of the mountain. (Interstate 80 is on the other side of the valley and looks like the tracks of a gigantic alien tractor.). My wife and I once rode down U.S. 40 in a wrecker pulling our Volkswagen Scirocco, which wouldn't start. The whole fiasco actually began in Winnemucca, Nevada, the only incorporated town and the county seat of Humbolt County. We were traveling west in July of 1982 to attend the American Bar Association convention in San Francisco. We pulled off Interstate 80 in Winemucca to fill the tank with gas, but when I tried to re-start the engine, nothing happened. Nothing. If you have not been to Winemucca, you cannot imagine its level of desolation. If humans ever colonize Mars, it will look like Winemucca. The one auto repair shop in Winemucca decided that we needed a new fuel pump. Of course, that shop did not have one in stock, so the owner called Reno to have one delivered by bus, which meant that my wife and I were forced to spend the rest of the day and that night in the middle of the Nevada desert. Not having anything else to do, we spent the afternoon in the only bar (in 1982) on Main Street. We drank a few beers and felt sorry for ourselves. The air conditioner in the window was whirring madly, like an insect preparing to mate, but the temperature inside was at least 85 degrees. But there was zero humidity, so the two lost souls from Oklahoma did not feet hot at all. Actually, it felt to us like a pleasant fall day. A man and woman walked inside. Both their faces looked like houses in need of paint. The man was tall and slender, hatless, his hair faded to light brownish-grey and thinning on the back top. The woman was short, also thin, and looked every bit as rough as the man. In fact, she looked rougher. They began playing pool on the one table in the establishment, drinking beer and arguing between shots. They were either recently divorced or else on the precipice. They were playing eight ball. The man would make a shot, then tell the woman that she had recently treated him badly. His language was a little more colorful, but that was years ago, and I honestly don't remember what he said. Then the woman would make a shot and snarl something back at the man. They hurled insults back and forth like kitchen ware. Besides the bartender, sitting on a stool with his eyes shut, my wife and I were the only other people in the establishment. The air conditioner whirred. I drank another beer. The woman sank the eight ball (intentionally), declared victory and stomped outside. The man followed closely, shouting something -- I don't remember what. "Well," I said to my wife, "every vacation has a low point. I think we just found ours." The next day about noon, the bus from Reno pulled into the station and delivered the fuel pump. The garage installed it, the automobile started, and we were on our way again. We drove to Reno where we ate a good meal, consumed adult beverages and went to bed. The next afternoon, we drove up the face of Mount Judah on U.S. 40, which more or less paralleled the original railroad line to the summit. The highway curved repeatedly up the mountainside, and the concrete snow sheds covering the single track line were clearly visible across the valley. We drove to the wooden snow sheds at Norden, parked the car, turned off the engine and climbed out to enjoy the scenery. No trains were nearby, and traffic on the old highway was negligible. Interstate 80 was on the other side of a mountain ridge. My wife and I stood beside the tracks, listened to the silence and tried to imagine the construction of this portion of the transcontinental railroad. Building a railroad through this terrain with men, mules, shovels and dynamite still seems incredible to me. "Okay," my wife said. "That's enough railfanning for me. I'm hungry." When my wife is hungry, my wife is hungry. We jumped back in the car. I turned the key in the ignition switch. Nothing happened. Nothing. "This is fun," my wife said. From time to time, I am subject to panic attacks. They come on all at once, like a thunderstorm, leaving me immobile. On hit me in the Volkswagen that afternoon. I thought, "This car will never start again. There's not a soul on the top of this mountain." "Do something," my wife said. I do not understand why, at moments of crisis, I am expected to solve the problem. That, I suppose, is the burden of being a man. If my wife reads this, there is a fifty percent change that she will laugh. Somehow, perhaps because I was much younger, I managed to unglue myself from the driver's seat and climb out into the pristine air of the Sierra Nevada. Not knowing what else to do, I started walking along U.S. 40, the old highway across the mountains. As stated earlier, there was no traffic. All vehicles were on the Interstate -- several miles away. I was hoping to flag down a vehicle and ask for help, but nothing appeared. So I continued walking. After a mile or so, I saw what looked like a small hotel hiding in the trees above the road. I have never been to Switzerland, but it looked like something built there -- based on the few photographs I had seen in magazines. How is that for expertise? It was dark brown with a steeply sloped roof to help with snow removal in the winter. Each window was flanked by heavy wooden shutters which were closed tight during winter storms. I climbed the wooden stairs to the front door and knocked, but no one answered, so I tried the door knob and found it unlocked. Inside, my eyes adjusted slowly to the gloom of a mostly deserted ski lodge -- not too many skiers in July. In a moment, I heard footsteps on the wooden hallway floor. A face appeared from around a corner, a very large man who obviously enjoyed a good meal. "My car is broken down, and I need help." He looked at me the way I used to look at my son when he did something foolish. "I really need help," I said. "Well," he finally said, "we've got a phone." You must understand, this was decades before cell phones. Finding an open ski lodge with a working telephone was like finding oil in your backyard -- assuming you own the mineral rights, which most people don't. I called a wrecker service in Truckee, while the large man stood beside the phone to make certain that I did not run up too large a long distance charge. (Those of you under 40 won't have the slightest idea what I'm talking about. Ask your parents.) Then I walked back slowly to the dead Volkswagen, where my wife sat waiting more calmly than I had dared image. "It's actually kind of nice sitting out here," she said. My wife is not an outdoors person. She is comfortable only between 73 and 78 degrees. She would have made a terrible pioneer. She gets hungry easily. The wrecker showed up in about half an hour. The driver hooked our vehicle up, then proceeded to drive back down the face of Mount Judah on U.S. 40. Below is an aerial shot of what that road looks like. The wrecker driver roared down the highway, with our little Volkswagen in tow behind. As you can see, the route down the mountain is precarious. Many of the cliffs along the roadside drop off hundreds of feet. We sat in the front seat with the driver. I kept looking out the rear window, expecting to see my car careening over the edge of the road, dropping below to the original mainline, the remnants of which are visible in the bottom of this image, including the two spots where the tracks are briefly visible between the concrete snow sheds. As mentioned, the line has been abandoned for years. If you look very closely at the open section to the right, you can see hikers on the old roadbed. Amazingly, our little car made it down the mountain. The wrecker driver took us to the repair shop that he claimed was "the best in town." Then he dropped us off at a small hotel where we had decided to spend the night. It was Sunday, so we only had to wait until the next morning to see if the Volkswagen would ever run again. Truckee is a small town, so we walked to the repair shop the next morning. It was about 10:00 a.m. No one was there. Our dead car was still sitting in the gravel parking lot. I looked at my wife. She looked at me. It occurred to both of us that we might be approaching another low point in our vacation. A little before lunch, a battered brown pick-up drove into the lot, the first vehicle we had seen that morning (other than our own). The bottom of the truck was covered with rust and eaten away, as though it carried a deadly fungus. After a moment, the door opened and out climbed a long-haired fellow with a big beard about the same shade of brown as the truck. In his right hand, he carried an open beer can. He introduced himself as "Ace." I don't remember the last name. I suffered another panic attack. I won't bore you with the technical details, but Ace actually knew what was wrong with the automobile and fixed it so that we had no more trouble for the rest of our vacation. If I ever break down in the Sierra Nevada again, I will look for Ace. An eastbound Pacific Fruit Express is cresting Donner Summit and preparing to roll downgrade on the newer track through the Big Hole. The tracks on the right are the original grade. The snow shed is the original wooden structure at Norden. Both the original tracks and snow shed are long departed. 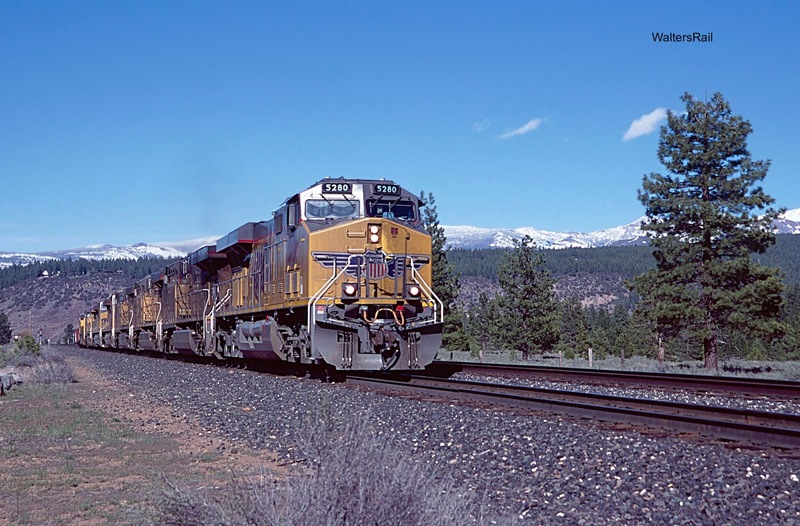 At dawn in July 1982, a westbound Southern Pacific manifest has emerged from the concrete snow sheds on the original transcontinental line before ducking again into another shed. The masonry fill in the left of the image was constructed by the original Chinese laborers in the 19th century. 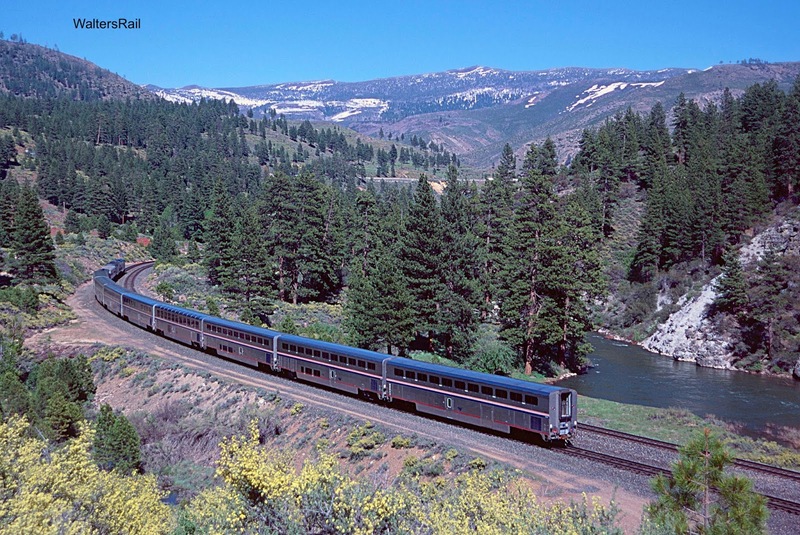 In June 2017, the eastbound Amtrak California Zephyr is rolling downgrade toward Truckee, California. Westbound stacks are climbing the grade toward Truckee, California -- June 2017. 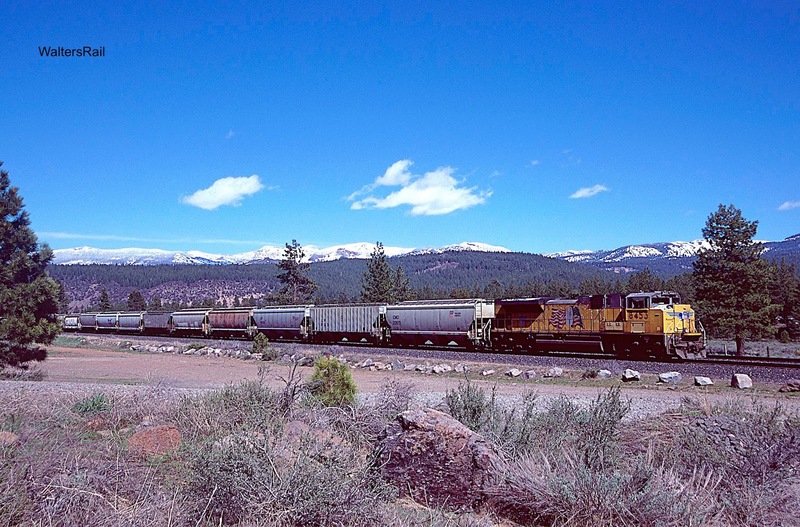 An eastbound potash train is rolling downgrade just east of Truckee. Eight units and a single load are climbing the grade toward Donner Summit. 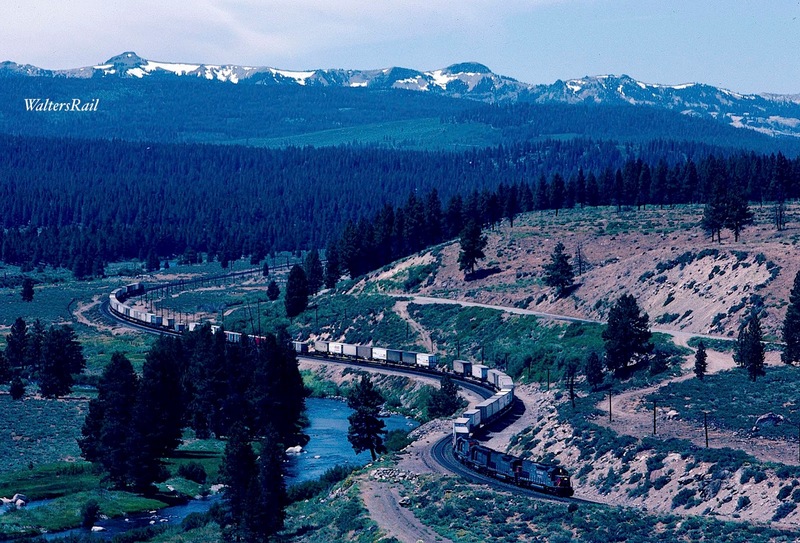 Eastbound trailers run downgrade beside the Truckee River after crossing Donner Summit -- July 1982. The same location in 2017. 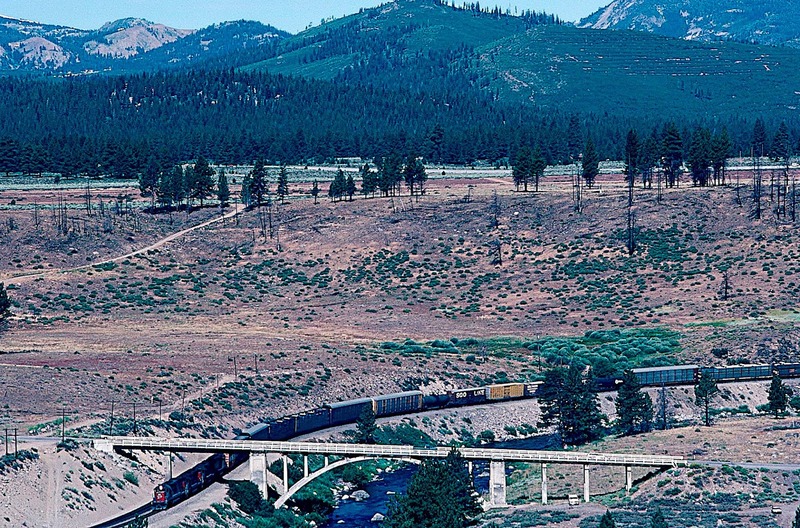 A westbound manifest climbs the grade beneath old U.S. 40 on the way to Truckee. Above, at the top of the open valley, is Interstate 80. 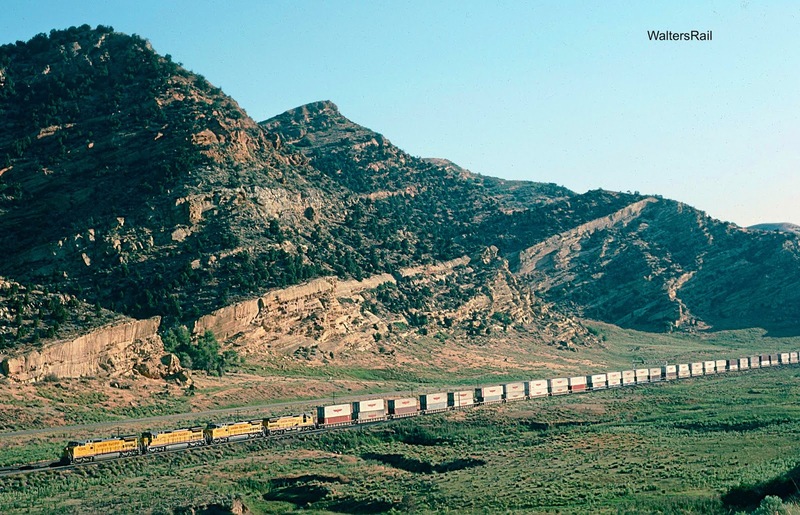 Here is the westbound California Zephyr at the same location -- July 1982. 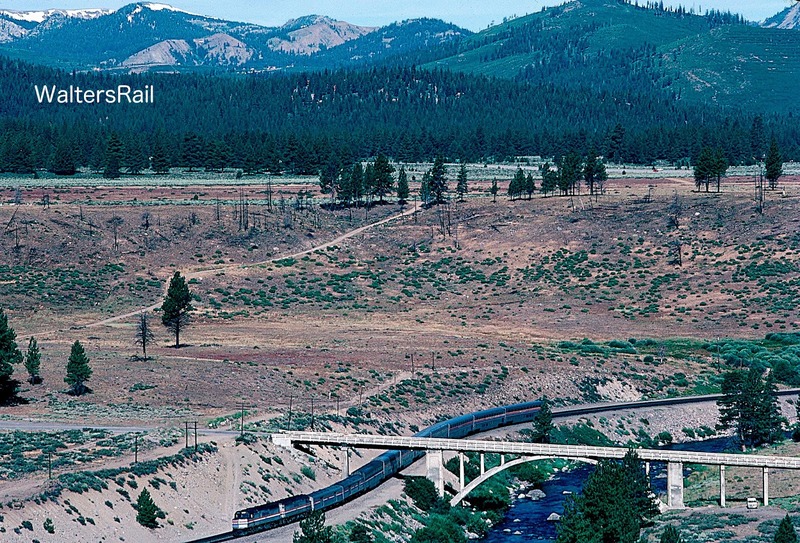 These views are no longer available, as trees along the Truckee River now obscure much of the tracks. 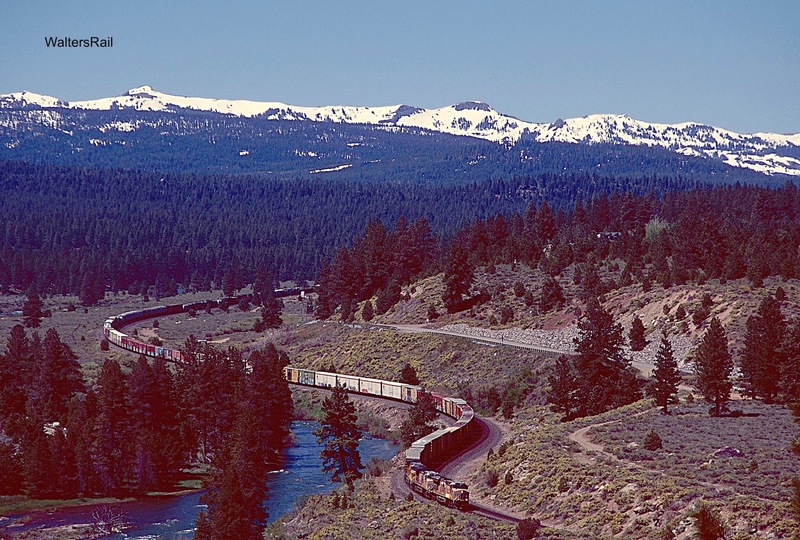 Westbound Southern Pacific trailers are climbing through the valley of the Truckee River on their way to Donner Summit -- July 1982. Interstate 80 runs along the ridge across the valley. The trees in the foreground have grown so tall that this shot is no longer available. 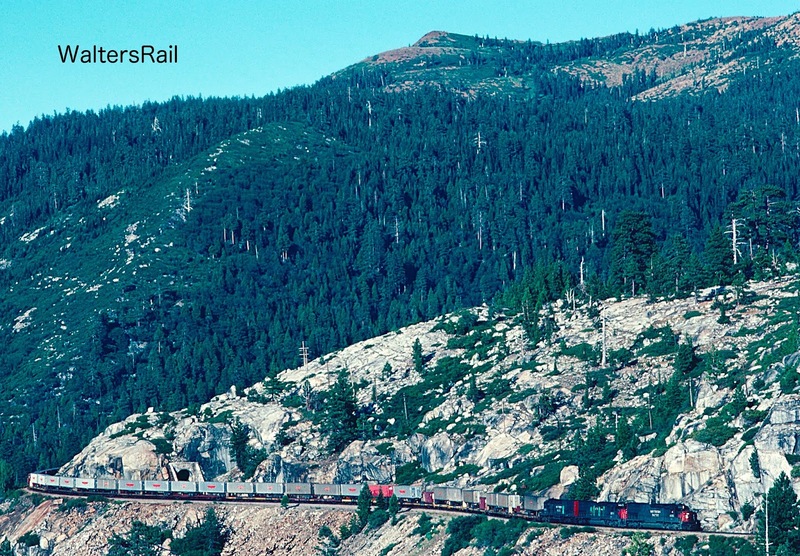 UP autoracks are climbing the grade to Donner Summit beside the Truckee River -- June 2017. This location is just beyond the rear of the train in the previous image. Here is the eastbound California Zephyr on the same date and same location. Westbound trailers are rolling downgrade at Yuba Pass. The west side of Donner Summit extends much farther than the east, because the Sierra Nevada rise out of the ground like a trap door, with the shallow side extending from east to west. 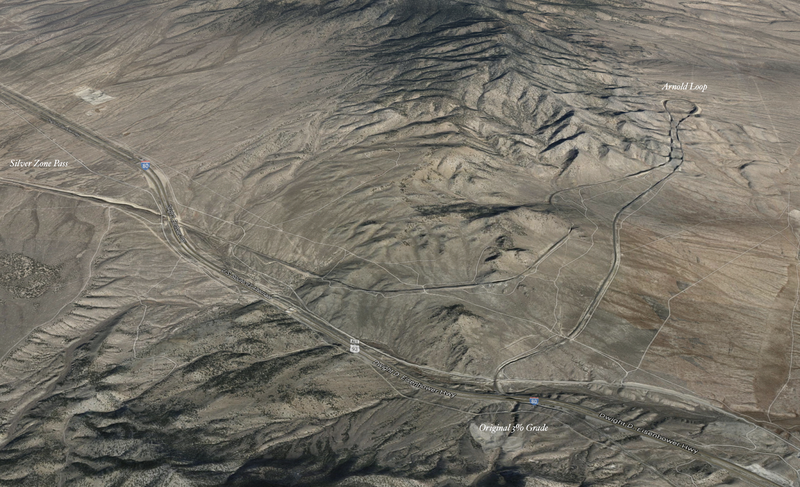 Thus, the distance from the eastern base of the mountains (Reno) to the summit is approximately 30 miles, while the distance from the western base (Roseville) to the summit is about 65. In the image above, the train is running on a track that was removed several years ago. 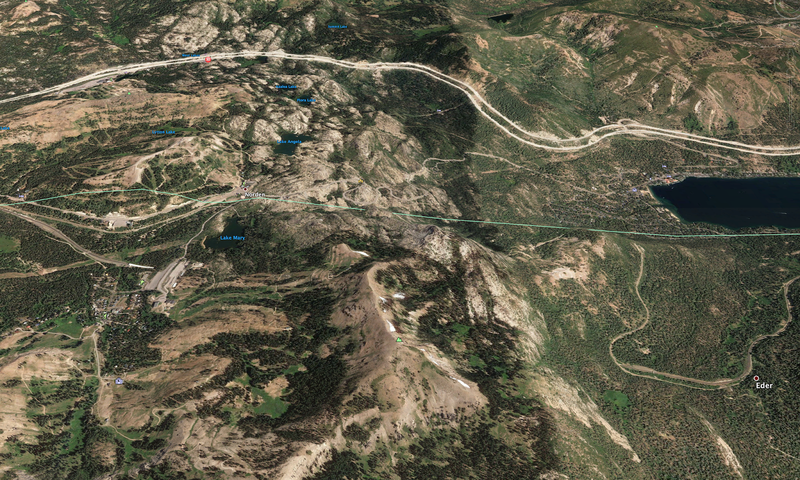 The line through Yuba Pass is now single track and runs through the tunnel show on the lower left. Same location with a westbound coiled steel train. These are some of my favorite locations on the Union Pacific and its predecessors. As time passes, and I continue to grow older, I sometimes wonder if I will ever visit them again. But I am determined, and so is my dog Bear -- aka Mighty Dog. We will be on the road again soon. If we are lucky maybe we will see you. Look for an old, grey-haired man and a tiny black dog who thinks he's ten times as large. For what it's worth, the dog also has a lot of grey hair. To see all my posts, go to waltersrail.com.